cooking and posting your meals here. Neely, I can always tell without looking at the name which posts are yours. Your food is so visually appealing. Beautiful plating. And great photos. Moe would be thrilled with any of your salads. I would like the one with the rice and beans. 2ManyDiversions, Sorry that you are going to have to continue with the Chemo. I have to tell you that I'm with your husband. I'd be stopping too if we had a local Mexican restaurant. Just one would be good. Snow is such a beautiful cat. She must bring you a lot of joy. Annie, as always, you certainly know how to put on a feast. Love the cake. Cookebook, that Gumbo looks so rich. Great photo. Both the Gumbo and your dog. Sleevendog, everything in that photo looks amazing. Could you please tell me what is in the top right corner? I don't know what it is but I want it. Since Matt doesn't eat meat (not sure how that happened), I decided to forego the turkey and went with beef tenderloin. Although we didn't actually have Christmas dinner until Boxing Day. Moe decided that he would be happy with another piece of his Tourtiere. Worked for me. 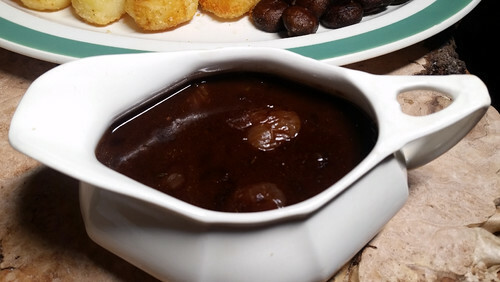 With a Burgundy sauce with braised pearl onions. 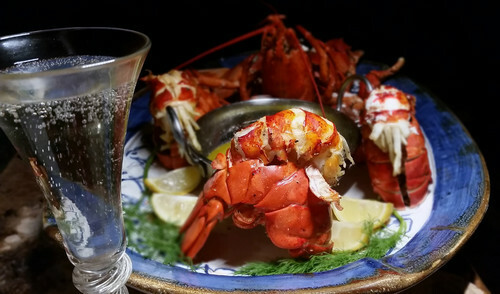 New Year's Eve was our traditional Lobster dinner. We shared three 2 pound lobsters. 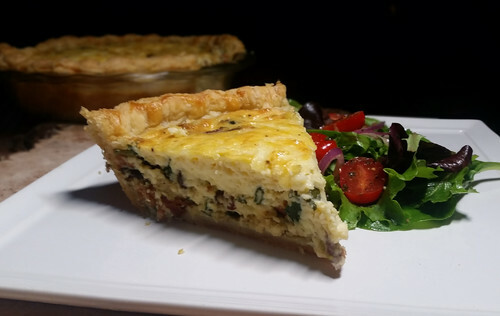 Breakfast/Brunch on New Years day was a Quiche. All butter crust with bacon, mushroom and spinach and white cheddar cheese. Funny, I never think to make quiche. I probably make one about every 10 years. I baked bread on New Year's Day. Moe requested a snack to hold him over until dinner. 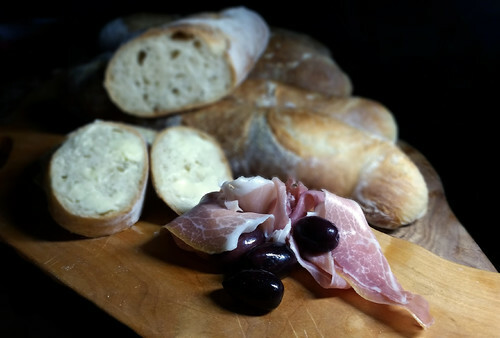 So he had warm baguette with butter and a little prosciutto with some olives. 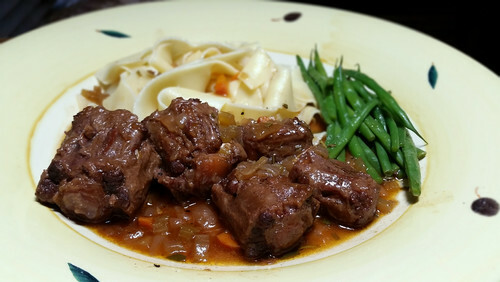 New Year's Day dinner was Oxtails. We were having dinner next door at our neighbours and I cooked. So no pics. Since Matt doesn't eat meat (not sure how that happened), I decided to forego the turkey and went with beef tenderloin. FOAS, I just meant I didn't need to cook a big turkey since it was only Moe and I. But, I agree it does read funny. AnnT, I also smiled at the part about Matt not eating meat, LOL, but the lobsters look so good that I probably wouldn't want to share them anyway. 2many, I'm sorry you have more chemo, but I do like to see SnowCat, the alien-in-the-attic, LOL. Neely, even your salads look good, and like AnnT, I'd like the one with the rice and beans. Here I'm still struggling, it seems that if Mother will eat it, Elery won't. 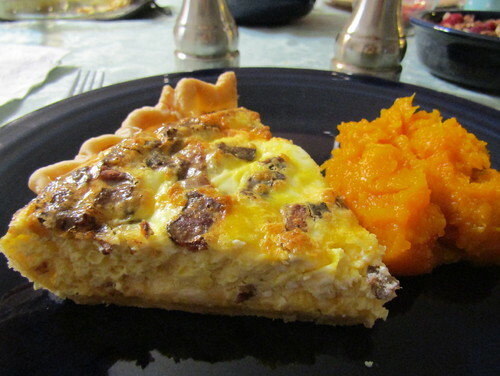 I've made quiche a couple of times for Mother, butElery won't eat it because it has crust. Mother won't eat frittata because it DOESN'T have crust, LOL. 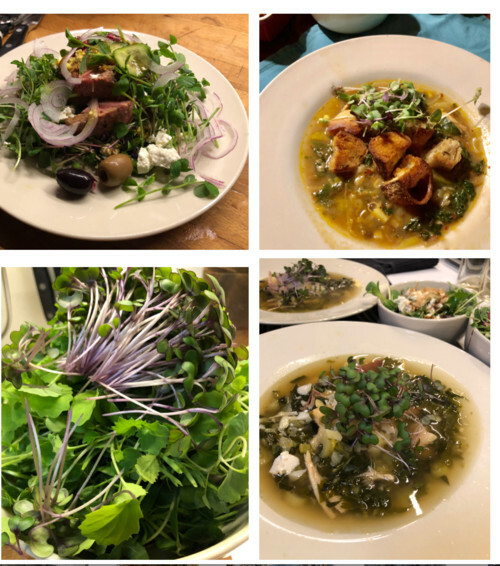 Last night we had a recipe Elery found from a place called Simply Nourished or something similar. It was a pot of beans with some chicken in it. It was edible, but Mother won't eat beans, so she had KFC. Dark meat only and she'll eat their corn muffins but not the biscuits and no mashed potatoes ever, no matter who makes them. 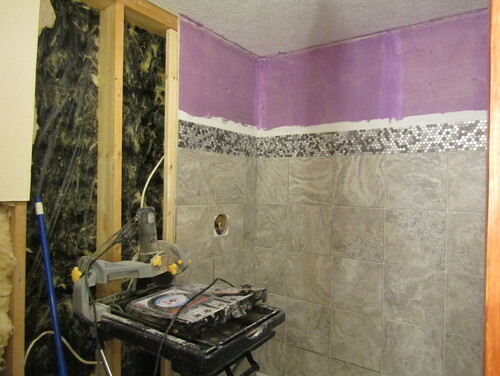 Dave and Elery spent Saturday demolishing my master bathroom, they removed the big stupid ugly Jacuzzi tub and we're putting in a walk in shower. Sunday they began framing in and installed the shower pan, so I made a ham, baked beans, mac and cheese for the kids, some homemade rolls, fried cabbage. 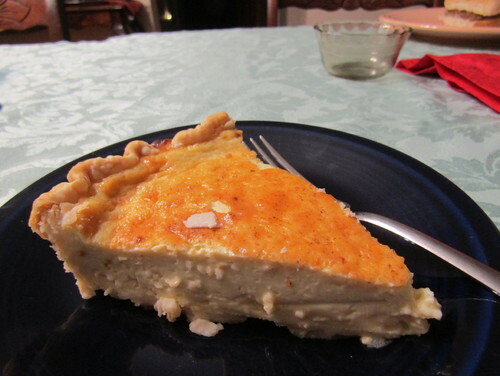 Custard pie for dessert and of course I didn't take pictures, but we still have pie left, I'll try to remember. Mother's been eating a piece every day. Tonight I think we're having hamburgers, it's 17F here and I need to go crank up the pellet stove. Mother has a doctor's appointment Friday, we'll see how she's doing. She says her back feels a lot better but she's still moving pretty slowly. Annie, Moe will eat pretty much anything I want to cook for him. It helps that he doesn't cook and has no interest in doing so. Works for me, because then I can cook what I feel like. But I do have Matt at home and he has been a vegetarian now for a few years (which I find really annoying), but he cooks for himself and will eat sides that I cook, just not the meat. 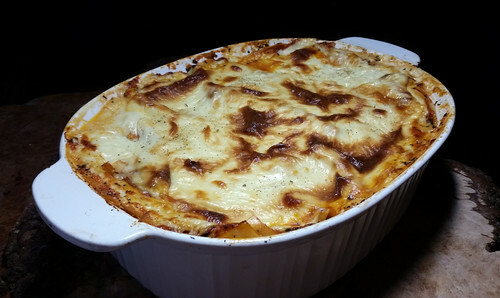 I did make a vegetarian lasagna yesterday. I had been promising Matt one all week. By the time it came out of the oven though I had lost interest. But Moe and Matt loved it and Matt has already had two more pieces this morning. 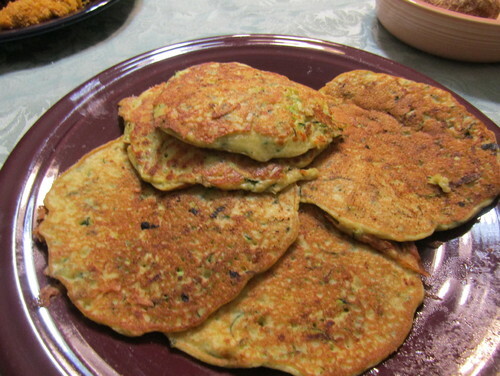 Sometimes I make this with just layers of zucchini. This time I used both zucchini and pasta layers. A few more meals from the last week. 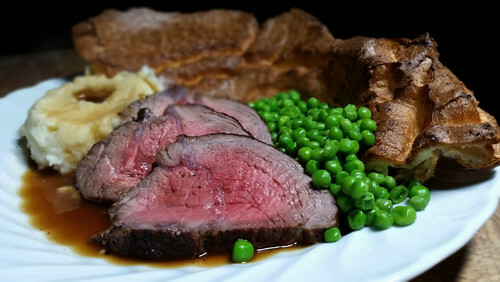 Sterling Silver top sirloin roast with Yorkshire Pudding. This was actually a breakfast for Moe and I took the same thing with me to work for lunch. 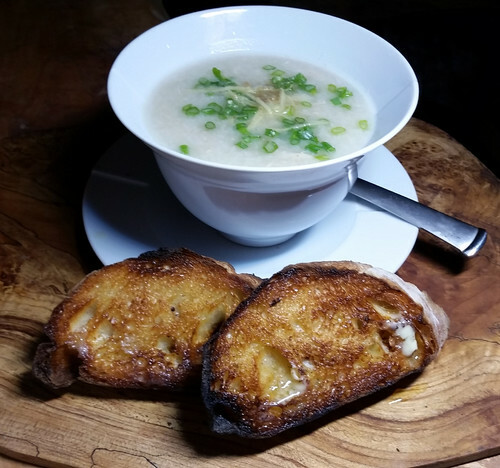 I made Congee with Chicken for dinner one night. . Made it in the Breville PC. Moe liked it so much he wanted it again for breakfast, with homemade toasted baguette. 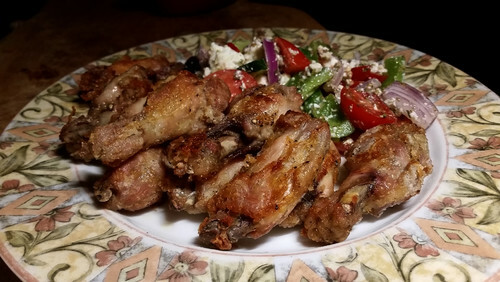 Wings another night with a side of salad. Another work night dinner . 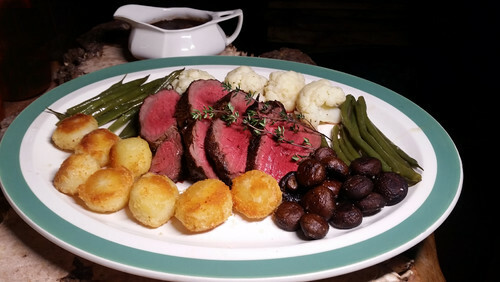 Grilled a small "Chateaubriand" cut and served it with just green beans and some sauted crimini mushrooms. Dinner took less than 45 minutes from the time I walked in the door. Annie's mention of burgers is appealing. I think that is what we will have for dinner. Thanks for that mention about my photos AnnT, I think it’s the light here in summer. I remember fondly Canarybirds’ photos had a strong light intensity about them due to the available sunlight... same here I guess. Wonderful meals AnnT and photos. You have lead the way here on What’s for Dinner showing us all literally what delicious and appealing meals we can have for dinner or breakfast or anytime for that matter Lol. Haven't had lobster in a long time. Same with quiche. I do make a crustless quiche (frittata) from time to time. No reason why it should. You're an incredible cook! I live without meat when dh is out of town. Even when he's home we have at least two meatless meals per week. Annie, have you considered making and freezing stuff your mom likes? I did this a lot when my dad was ill and I couldn't come cook for him every night. I would also cook a bunch extra and freeze 2 serving packages in my foodsaver when my FIL was widowed! He loved going to the freezer and finding a new home cooked meal! Whenever I made "hearty" things that he was used to from the 50s-60s I would bag some up! 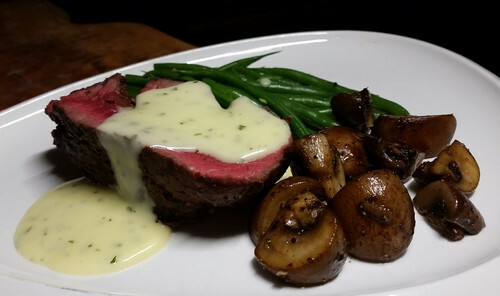 His final words to me was "I always loved your cooking"
AnnT, that sirloin looks so good, it's perfectly done and sirloin is one of my favorites, it just has such a nice "beefy" flavor. And I know what you mean when you say you cook something and by the time it's done you're over it. I do that often, spend time making something and then decide it doesn't sound good any more. I'm happy Matt is enjoying it, though, and doesn't have to share it. neely, that fish looks perfect. Elery and I went fishing in Texas a few years ago and caught whiting, and fried it back at our motel kitchenette. It was very good, but the frozen stuff we get here that they call whiting doesn't taste the same. Nothing tastes like fresh, I guess. nancyjane, I'm still trying to figure out what she likes! Today's total food consumption was half a deviled egg and black coffee for breakfast, half of a salmon cake for supper and a glass of red wine and a handful of dark chocolate M&Ms before bed. Lots of coffee. She doesn't want anything to eat in the morning, she's never liked breakfast. The only way she'll eat eggs is deviled. She won't eat most beef, pork, chicken breast. She'll eat dark meat, but only from KFC, original recipe. She ate a burger a few nights ago but won't eat meatloaf or meatballs. Shrimp and fish she likes but only fried and only occasionally She doesn't like fruit or salad and won't eat anything with beans in it. Potatoes can be baked or french fried only, she particularly dislikes mashed and she won't eat pasta. No green beans in any form, but she loves broccoli. She does like biscuits and homemade bread but doesn't care for any soup except broccoli with cheese, won't eat sauerkraut and beets must be pickled. She weighs 82 pounds and her cholesterol is 426. (sigh) Blood pressure today at the doc's was 186/96, they said she's got the worst combination of numbers they've ever seen in a person that's still upright. So tonight we had salmon patties, mashed squash and steamed broccoli. She ate half of the salmon patty, no vegetables, 2 cups of coffee and declared herself full. Tomorrow the guys are going to frame in the shower. I think everyone will be here for breakfast so it will probably be eggs, bacon and pancakes. She won't eat any of those things, but her yogurt is in the fridge and there will be lots of coffee. Annie, maybe the coffee suppresses her appetite. ..however at your mom's age it's not uncommon to dislike many foods. It's also not uncommon to only eat a little. With the activity level being very low at this age she may just not be hungry so a few bites is enough. Have you spoke to her doctor...also how about Ensure or another brand...will she drink it...you could get the vanilla add ice cream and her raspberrys?? that she likes. Anyway you sound frustrated and worried so id call the doctor just as a touching base kinda thing. Hang in there, I'm sure your doing a great job caring for your mom while she heals. mamapinky, I am both frustrated and concerned. The doctor agreed that she isn't eating "enough", but didn't have any suggestions, I think she was far more concerned about Mother's blood pressure at this point, which is probably valid. I've taken to offering her a "snack" a couple of times a day, so she has yogurt for breakfast and whatever we're having for dinner, with two or three small snacks in between. Today it was a couple of fig newtons with her coffee between breakfast and supper (none of us eat lunch), and then a few cashews before bed with her glass of wine. She won't have anything to do with Ensure or any of that type of drink, and I considered putting them into her coffee. Then my brain kicked in, and I realized that she loves a coffee drink from the local coffee shop that consists of milk, coffee, raspberry Torani and some white chocolate. 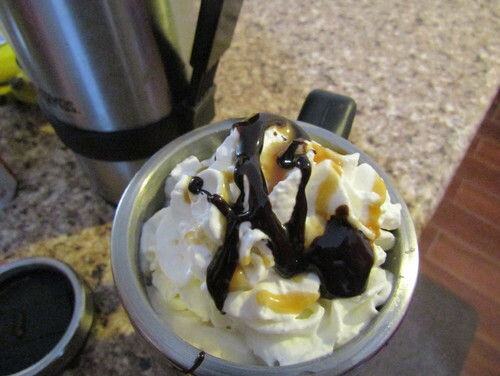 There's no possible way I could ever find flavored coffee syrups in my town, so Amazon to the rescue. So, it's not ideal, but she's getting her coffee, and I'm managing to get a couple of cups of milk in that coffee daily. I'm using 1%, trying to keep the saturated fat down, and the syrup is pretty much just sugar. So, what's for dinner? Pork loin, au gratin potatoes, collard greens, green beans, homemade biscuits, pickled beets, brownies with cream cheese frosting. The guys are working hard on my new shower, so I have to feed them! Mother had a slice of pork loin, some green beans and half a brownie, but she'd also had two cups of my homemade "cappucino" and two "mini" sized bran muffins. I find that if I make smaller portions she doesn't find it as overwhelming as trying to eat a full sized muffin or slice of pie or whatever. Looks so good...and the sauces. The photos! I need to up that game but never take the time or forget. I usually just take 'in process' shots with my phone so I remember what I did. Really just takes 5 seconds if a photo spot is set up. Ann and Neely. so yummy. Always gives me ideas for the up-coming week or two. Roasting a small bird with roasted roots and veg today. Comfort meal. Ann, I always intended to post the fishes menu but revolving door of house guests and busy multi-tasking...a co-worker calls me 'chaos muppet'. He is dit-tech with cables rolled and labeled, very organized. That pic must be the spring rolls. That was one of eight and we ate that one for breakfast it was so good. My thread noodles had miso, fish sauce, tahini and a seaweed hijiki salad mixed in. Tasted like the sea. So good. Made some fresh pickles last week for a co-workers birthday. Nice contrast to all the cake. Made a tray of veggie tacos. 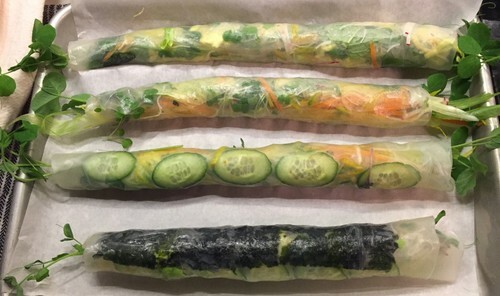 Sleevendog, you make the prettiest salad rolls ever. 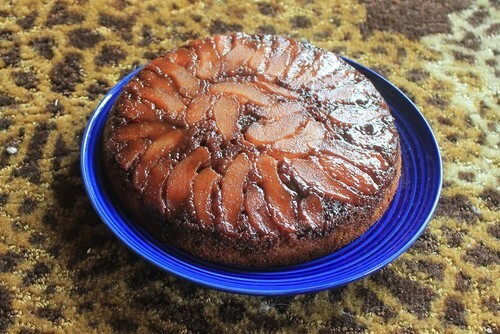 I baked an Apple Dapple cake last week that was well received by Moe and Matt as well as my next door neighbours. Very moist. Will definitely make this again. Made Matt a vegetarian Zucchini Lasagna. 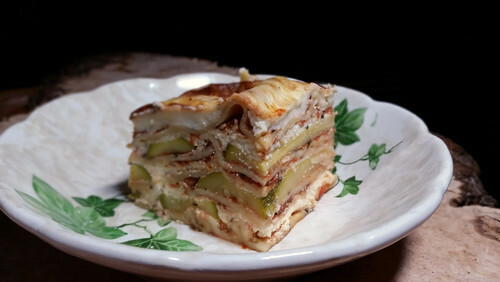 Layers of pasta as well as zucchini. Both Moe and Matthew enjoyed it. I prefer mine with a meat sauce. 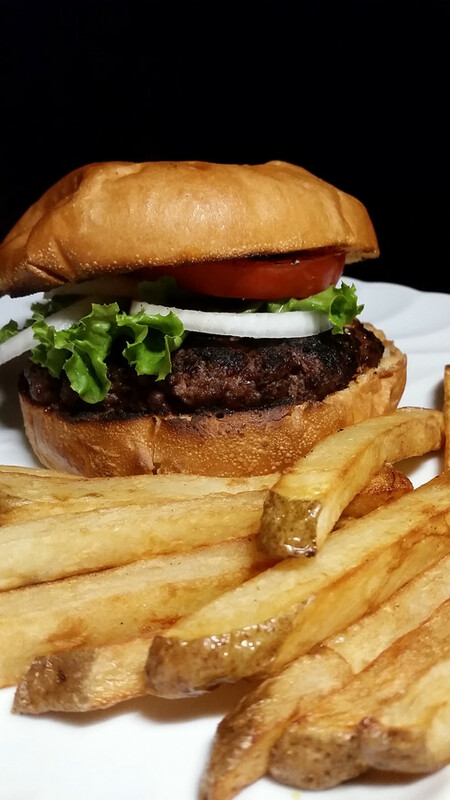 Burgers Thursday night. Quick dinner on a work night. With double fried fries. Oxtails for Moe's breakfast one morning. I took the same for lunch. I browned on the stove and cooked them in the Breville PC. 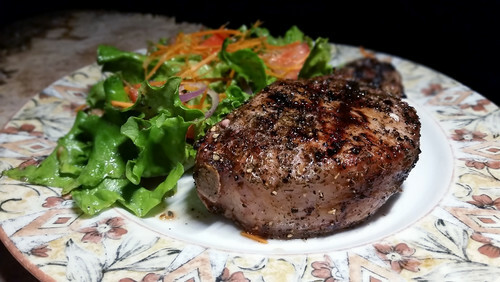 Grilled thick Pork Chops for dinner Saturday with just a side salad. in the morning before leaving for work. 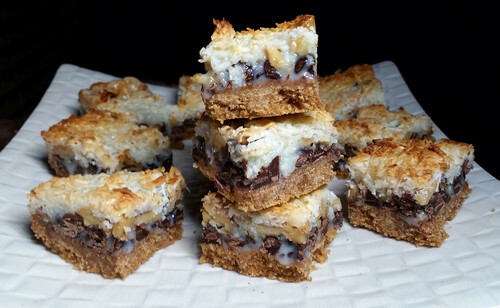 Baked Hello Dolly squares just before bed Saturday night. That way we weren't tempted to eat them while they were still warm. Sleevendog, your vegetable dishes always look so healthy, and generous portions. I'm also curious about your cracker kits. Ann, marvelous pics and food! The french fries just jumped off the page. I keep telling myself to make some, but it slips out of my mind. Annie, I feel so bad for you with having to try and make something your mother will consistently eat. 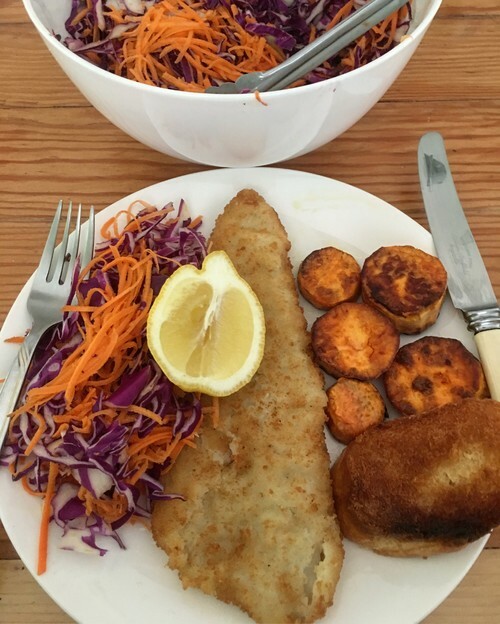 Neely your fish and chips looks so good. I bought some peppers marked down and first thing I did was make a Spanish omelette (peppers and onions in a tomato sauce). I love this small cast-iron skillet, it's virtually non-stick. 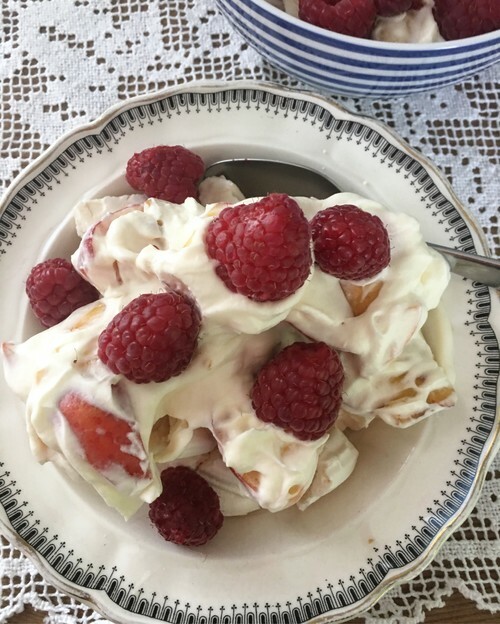 All last week I was wishing I had some kind of dessert, which is quite unusual for me. So I made a crostata to have this week. Jasdip, I love that you baked your crostata in cast iron. I'd love a piece warm with vanilla ice cream for breakfast. and made linguine to go with. Moe sure does eat well. You are an amazing cook AnnT. You all are. Jas what is a crostata? 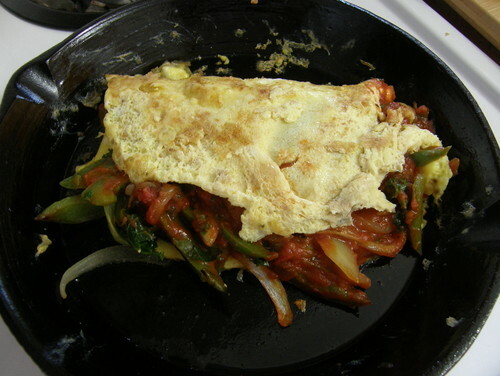 It looks like a apple pie...country style and it sure looks good and your omelet...that's the only way I will eat eggs, yours looks so good that I've decided omelets are on tomorrow's dinner menu. I used to search Google for recipe ideas which of course wasted much time and ingredients, now I just search this CF..no. more wasted time or ingredients. Mamapinky, yes a crostata is just a rustic pie. It's so much easier than making 2 crusts. 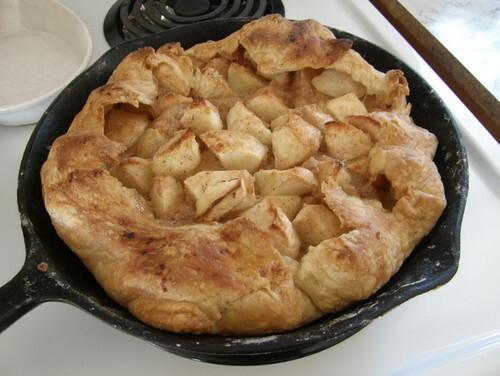 The actual recipe is Ina Garten's apple crostata. 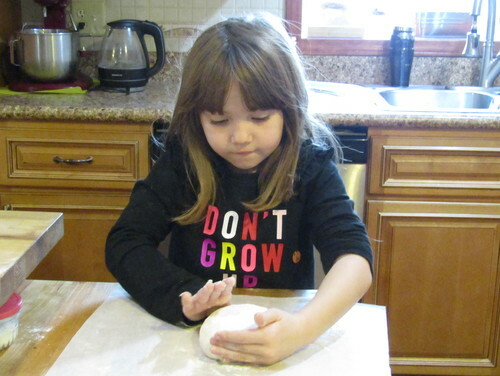 I use my own pie crust, but hers is good a well. Funny story......I take pictures with a camera, I don't like my phone. The other day the little usb thingy fell *inside* the camera, so the cord was useless to download my pics. I went to a camera store and the very nice, honest owner said it would cost more to fix than the camera is worth. He then showed me how a card reader works.....take the little memory card out of the camera insert it into the device, and plug it into my laptop. Easy-peasy. Last nite I took some pics of my glorious sausage on a bun loaded with sauteed peppers and onions and fried potatoes. So many yummy meals. Sleevendog that platter you took to work looks great and I bet it went down a treat. Your spring rolls look good, different to mine as mine are short and fat whereas yours are long and skinny. HaHa!!! Annt all meals look so good especially the Apple Dapple cake, just saying it makes me smile. Jasdip Spanish omelette Yum and the crostata or free form pie looking so good. I think sweet things are appealing at the moment as it’s too hot here for baking. Just having fruit salads for dessert. 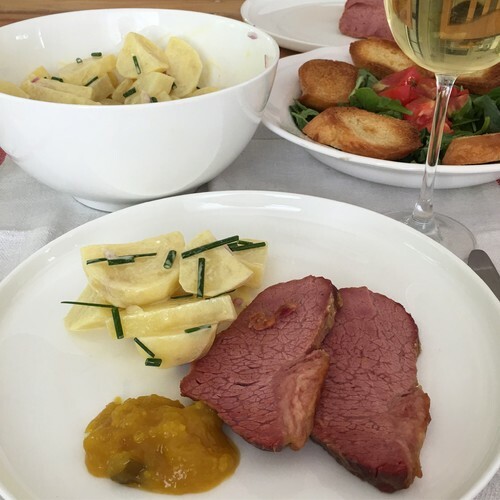 Cooked a piece of corned beef outside and it did us for a few cold meat and salads meals. The opposites of climate are quite hard to get used to. So different when we talk temperatures. I agree, Nelly. Seeing your salad plates and remembering that it's brutally hot. You must be thoroughly turned off seeing heavier, hot foods that we all post. I love seeing all the comforting cold weather foods. I much prefer cooking in the cooler weather. I get so excited when I can buy chicken drumsticks for .79/lb which is what happened recently. 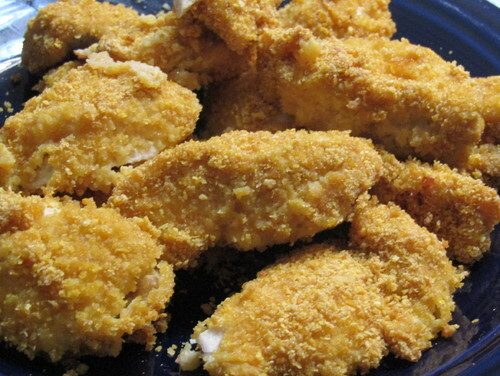 I wanted to try an 'oven-fried/unfried' chicken recipe. 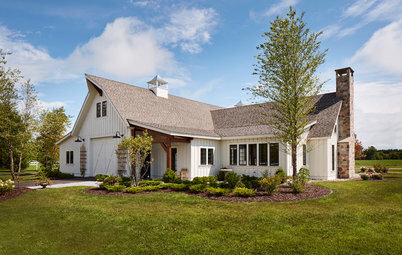 This is Trisha Yearwood's. Even though I refrigerated it after breading, the breading still fell off in spots. It was okay, but nothing to rave about. It's been 2 months since I lost my sweetie and I don't like my life one little bit. I don't enjoy cooking and I loved cooking for him. I did join a cardio class (we were both going to go, anyway) and the instructor asked me to join her Zumba Gold class, she likes me :-). I've also met a couple of recent widows and I'm getting together tomorrow afternoon with 1 and tomorrow evening with another. I want to share the picture that 2ManyD. did for me. Hubby had posted a little sentiment to me on his Facebook page back in March when we were in the midst of a myriad of treatments. I remember him doing it at the time, but had forgotten about it until I saw it on his page. 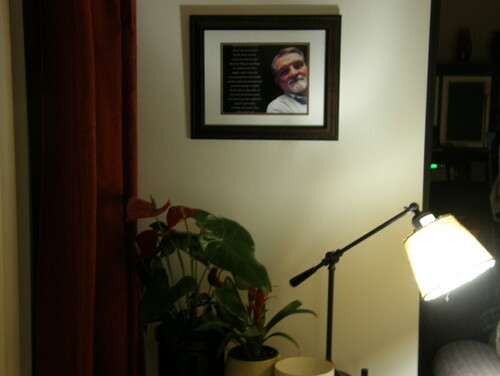 I treasure the words and the photo that she did. deeply in love with her that I am." Come summer I'm going to try and take a page out of your book Neely, and make Moe more cold dinners. He would be happy with any of your salads. Unfortunately for him, I'm the one that doesn't really care about salads. But I'm going to try. 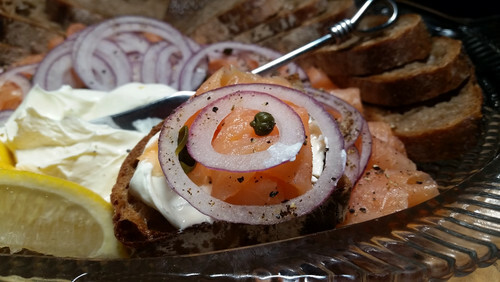 and we had bagels and smoked salmon for dinner. And I think we will have the same thing for dinner tonight. AnnT, those bagels look amazing, as always. I'd have them for a couple of meals, that's certain. The french fries, though, now those are just perfect, golden and crunchy. sleevendog, the spring rolls are beautiful, and I just made another batch of your pickled mustard seeds, I like them with a lot of different things and so I need to order more seeds. Jasdip, I'm glad you are making friends and doing things with other people, even if you don't feel like it. And I LOVE that picture that 2many did for you. Neely, we must think alike, in spite of our weather differences. There you made corned beef and here, where it's 7F, I made corned beef, although mine became hash, which Mother actually ate two servings of! .nancyjane, that's my Mother, not my MIL. She's still not eating much, but she's settled in a bit more. She's bored, but can't hear the television and we don't have cable or satellite TV anyway. She does read, but she's not allowed to lift anything, not even the cat. She doesn't knit or sew or anything like that and she's already sorted out all my pictures. So, she takes her walker and paces through the house, round and round. We did have a steak salad one evening. This was Elery's because it looked prettier. (grin) His had marinated peppers and artichokes and olives, none of those things went on my plate or on Mother's. Mother ate the steak and a few of the other vegetables and handed me the plate of lettuce, telling me to "feed that to the cows", LOL. Tonight we had baked salmon, roasted butternut squash and broccoli. Mother ate the broccoli and the squash, but turned down the salmon, which she used to love. 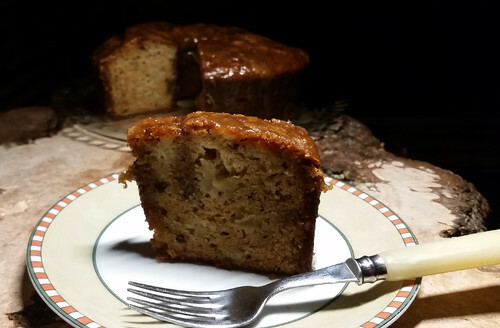 I just took a loaf of banana bread out of the oven, she might eat some of that tomorrow, she does seem to have a bit of a sweet tooth. I have a turkey thawed for Saturday's dinner, everyone will be here still working away at that shower. Elery's daughter and son in law will be here Tuesday for a couple of days and she says she's on the Paleo diet "kind of". She won't eat dairy, eggs, grains, seeds, nuts, legumes, gluten or anything "starchy" like butternut squash, sweet potatoes, corn. Oh, and no sugar, no caffeine and no fat other than grassfed butter. Elery has lost 90 pounds, but still will only eat fruit, vegetables and small portions of meat, along with beans and eggs. Mother will change her mind from day to day. I think everyone is going to just eat leaves and air. Oh Annie, what an assortment, but I know you'll manage the kitchen like a champ. Possibly even with good humor LOL! :Your bathroom is looking good, can't wait to see the final pics! You're so lucky that you have dependable labor! Feed them and they work! Elery lost 90lbs???? That's amazing! The coffee that the Princess whipped up for Great Grandma, looks pretty professional. Dan would definitely like that! Corned beef vension hash? If you lived closer, DH would be right over! Ann T-- what can I say? Your food always looks fabulous! Even if it's not something that I would eat, it still stirs the digestive juices! Jasdip, what a beautiful sentiment! How sweet and thoughtful of 2Many to turn his sentiment into a keepsake by printing it on a picture. You'll always have him in your heart. Glad to hear that you're pushing yourself to eat and to make new friends. Life will become a new normal. Keep it up! We're all rooting for you! Neely and Mama P, glad to see you being active here. Sleevendog, those rolls look delicious! So sad Jasdip, wish I could give you lovely hug. Not that it would help but just to show I do hear your sadness. 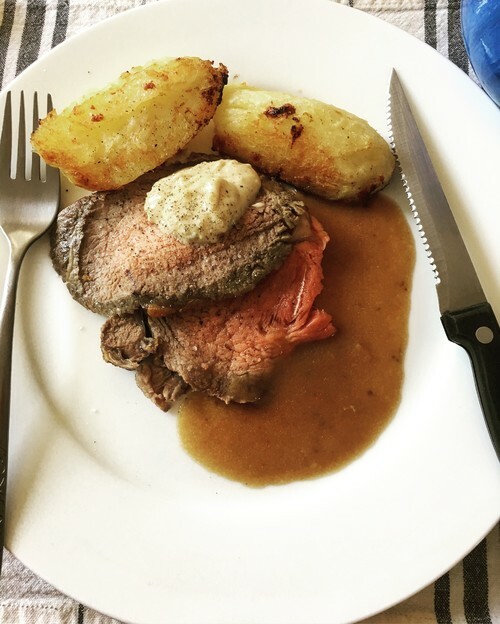 The weather here cooled off enough to have a roast... beef with creamed horseradish and roasties. Would have made Yorkshire puddings but forgot. I ‘ve mentioned before that DH is English and loves his roast especially on a Sunday. 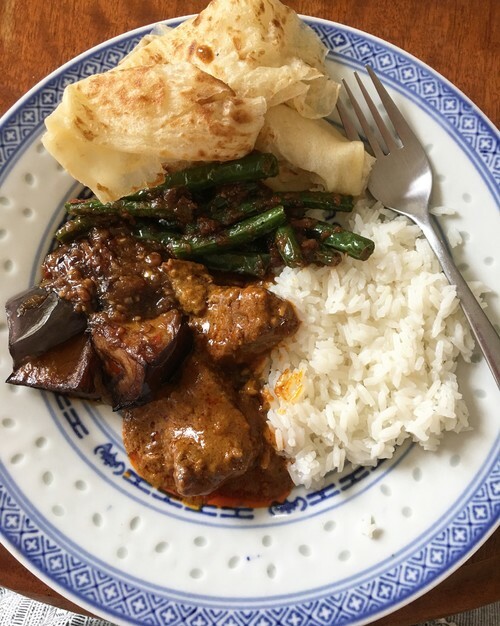 On Sat we had take out, Malaysian food, Beef Rendang with Belachan Eggplant, Belachan green beans and Roti bread. I cooked the rice. ‘I cooked the rice’ being the equivalent of Baby’s ‘I brought a watermelon’ in Dirty Dancing. Sorry, my sense of humour is a bit silly at times. Jasdip, what a lovely gift. I remember when you shared the words Tom wrote. That's something I would have wanted to be reminded of on a regular basis. jasdip, that is a beautiful portrait. My heart hurts. Loss is tragically unfair. We are on the post holiday raw veg/soup/salad kick as we do every year jan-feb. But that beef looks so good Neely. 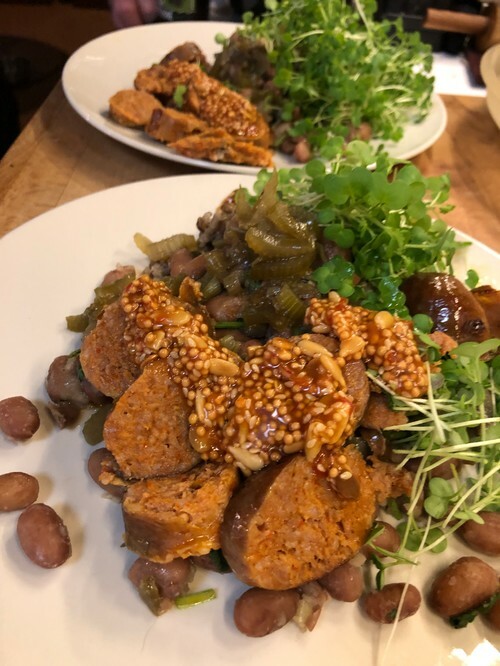 So, i made a RanchoGordo beans and mixed grain rice with my homemade semi-spicy sausage. not pretty but so good with a snow storm approaching. made great hash this morning with eggs. I made a big batch of pickled mustard seed but took a couple Tbsp and added toasted sesame seed and pepitas, some pepper flake for a sauce. Annie, you sure persevere with your cooking limitations, and make great meals nevertheless. Your hash really looks good. Ann as usual your bagels are right out of a magazine. Incredible. Hubby was the bagel lover so I'm likely not going to bother making them again. I really found them quite time-consuming and honestly a PIA. But they sure were a treat, they tasted totally different than anything bought from a grocery store. 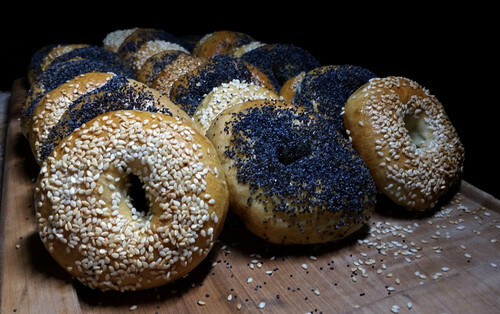 Hmmm after writing this, I've got a hankering for a home-made bagel! Neely your roast beef and potatoes are perfectly done. Wow. I'm like your husband, love yorkshire puddings, but don't think to make them a lot of time. Sleevendog, you're the healthiest eater of the group. I'm always amazed at what you can do with a salad. I tried a new recipe again, just one that was posted on Facebook. Steak and potatoes in foil. I had a lone small steak languishing in the freezer so it got cooked up today. 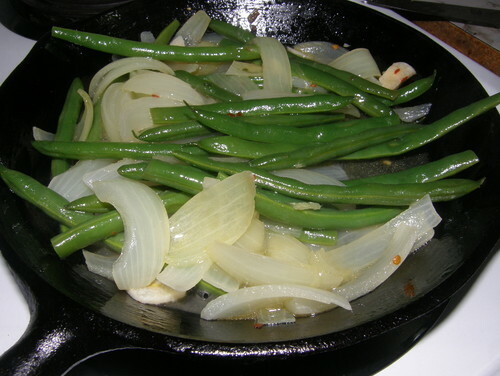 Green beans and onions simmered in the cast iron skillet. Agree with Jasdip that Sleevendog’s meal look very healthy with such a variety of veg and herbs. 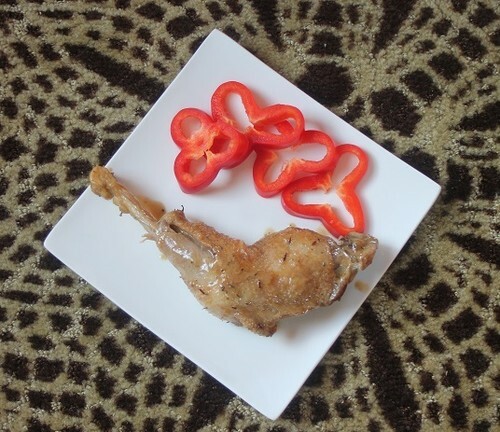 I can’t quite make out those fish drumsticks looking pieces. Something we don’t have here I think. Hot hot hot here. 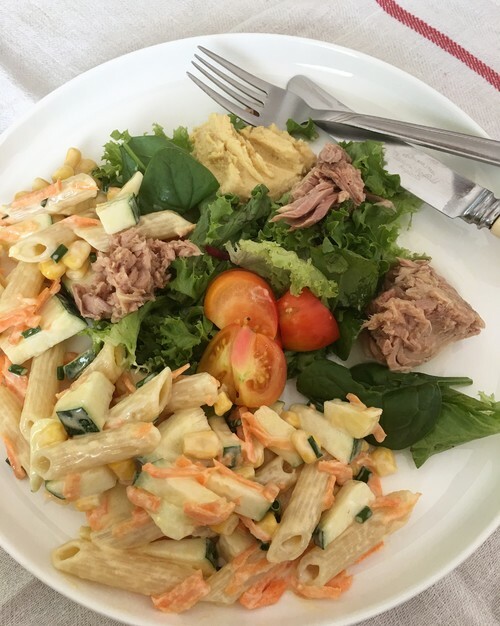 A simple salad. Not wanting to cook in the heat. Cooked pasta in the morning. At last we have some homegrown tomatoes. Edited to say that I am longing for soup. Turkey meatloaf (best if you use 1/2 the amount of chopped mushrooms as meat and a LOT of worcestershire! ), air fried taters and purple cauliflower from the garden. Last night was stuffed portabellas and salad from the garden. Sorry ancient phone won't co-operate with posting pics! Ellen, tell your DH that you can both come any time and I'll be happy to make him some hash. Or just the corned venison. Or whatever he likes! Neely, that roast is perfectly done, nice and rare, just like I like it. 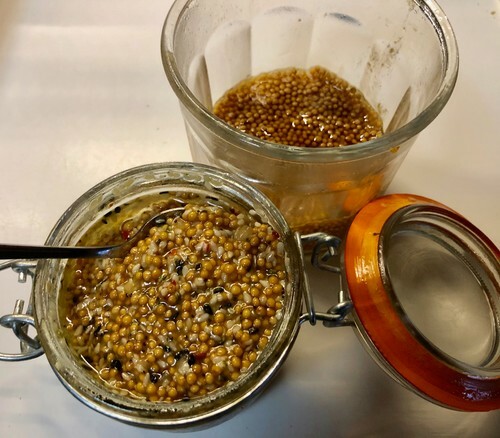 Sleevendog, I just made a fresh batch of your pickled mustard seeds. My step-daughter has been using it on everything, she loves it. Shrimp salad? That sounds really good, I'll have to make that soon. Jasdip, those onions and green beans look really good, I like cooked onions a lot. I've been thinking about you and sending you lots of strong thoughts. Neely, I think those little fishes are cornbread, it's common here to bake corn bread muffins in different cast iron shapes. Unlike Neely, it's really cold here, below zero much of the time. 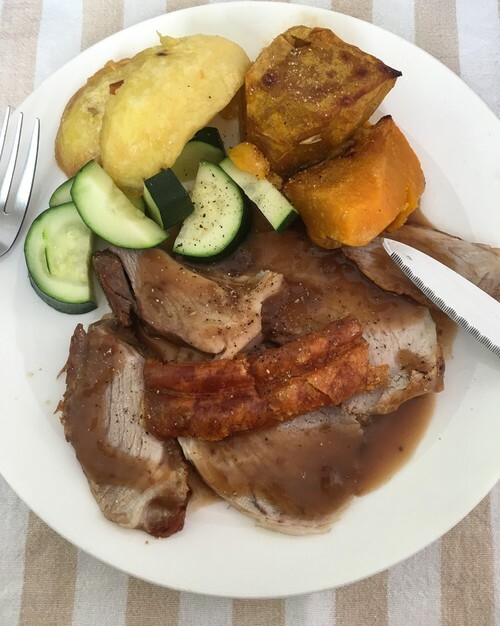 Elery's daughter and son in law are visiting from Ohio, and so last night we had pork roast stuffed with bacon and mushrooms, salad, collard greens, and carrots. Tonight I made breadsticks with some Cauliflower flour, they were very strange. We also had porterhouse steak, salad, stir fried pea pods and asparagus and some mashed potatoes for the SIL. Mother wouldn't eat any of it, I warmed up some broccoli cheese soup from Panera Bread and a corn muffin for her. I also made a batch of onion soup and right now beef bones are in the 5 quart Nesco. They'll simmer overnight and tomorrow I'll make a batch of beef vegetable soup. \Onion soups soups good about now...this weekend it will be cold again. 50 today melting all the snow but back to below freezing the weekend. I made a big batch of mustard seed and almost gone. I added toasted black and white sesame seed, a tsp of toasted sesame oil, pinch of pepper flake...for a spring roll topping. horseradish and wasabi is also good but I made a wasabi dipping sauce as well for some spring rolls and veggie tacos for work. I'm back in the spring roll game as so many friends request them. An advanced plan using 2 9inch rice paper sheets overlapping makes 8 bite size. 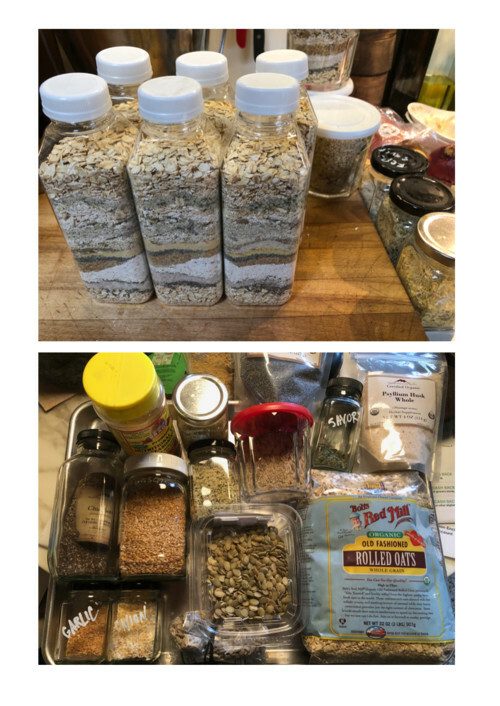 I can made ten in about 20 minutes, (with some do-ahead prep), I can make ahead by 4-6 hours left in roll form covered with parchment then a damp kitchen towel, fridge, and cut/serve as I need them. 10 rolls makes 80 so perfect for 10-15 people. To travel I use the round bamboo steamers. They are the #1 requested birthday gift. For parties I just make veggie. Smoked salmon and shrimp I only serve at home. Smaller crowd. As well as veggie. Neely your pasta salad looks great! Funny that you're craving soup in the dead of summer, haha. Another new recipe last night......shrimp, orzo and tomatoes,topped with feta cheese. It was very good, and a keeper. I started a new "keeper" binder. In time I'll be able to cook out of the original one. I know I need to keep up on this thread in GW. Sous vide pork country style ribs. I pre-seared these, as I added in a marinate into the sous vide bag. 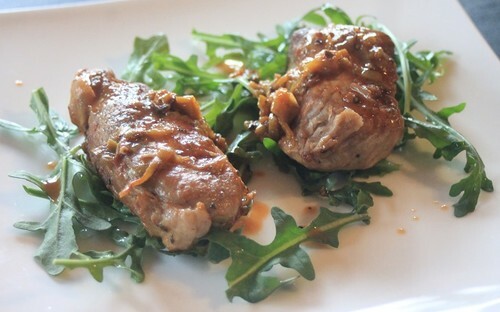 Served over arugula. Loved it! 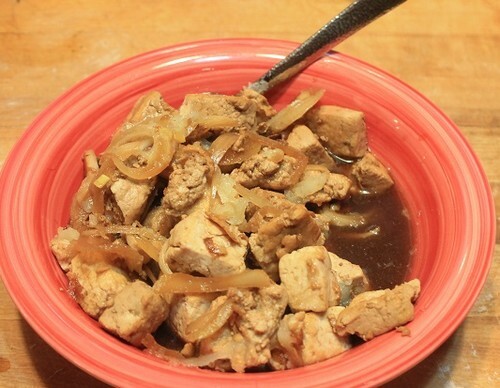 Pickled tofu. A Korean banchan (aka side dish). Served cold, and any hot peppering is optional. Stuffed with spinach, leeks, and cream cheese (and dill). AnnT, that looks like a perfect breakfast to me, and I hope Moe is recovering quickly and well. artemis, I've never heard of pickling tofu, that's interesting. I'm off to look that up, right after this post! sleevendog, I have one of those pans in the shape of sleeping kittens, the girls used to love to use it. And now I have to order more mustard seeds, you just reminded me. Jasdip, I think I'd like that shrimp dish very much. Here the guys just finished the shower, drywall is next, so I made dinner both days. Yesterday it was smothered sirloin steak with onions and mushrooms, french fries, mashed baked Hokkaido squash from storage, home canned green beans and garlic rolls, with no bake oatmeal cookies for dessert. Those were made with gluten free oats so Amanda could eat them. Tonight it was pork ribs with BBQ sauce, potato salad, baked beans, the rest of that squash and brussels sprouts, along with a fresh loaf of beer bread. Dessert was frosted brownies and Amanda had a Mounds bar because the brownies were not gluten free. Mother had Kentucky Fried Chicken and squash both nights and some potato salad tonight. She wouldn't eat the sirloin or the ribs. I forgot to take pictures. We are supposed to get a storm starting any time, 40 MPH winds and 12-18 inches of snow in the next 12 hours. 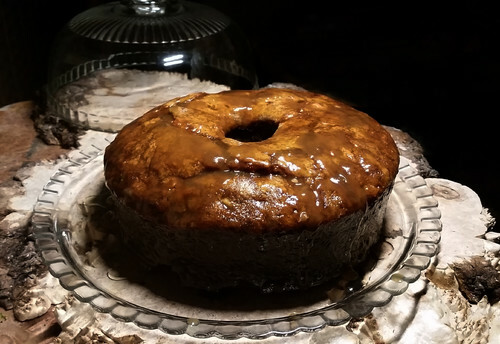 So, after I catch a few hours of sleep I think I'll take the rest of last week's bread and make some bread pudding and maybe a batch of squash soup with the rest of the cooked squash. 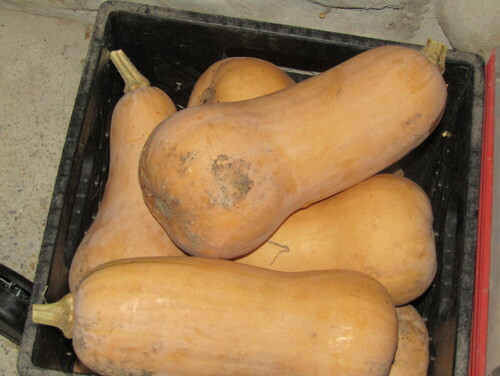 I still have 3 crates full of squash in storage, they've been keeping really well. Yum, AnnT, I forgot about those graham cracker chewies. My girls used to eat them warm, right out of the pan, with a spoon. I'm betting the grandkids would like those, I'm going to have to try them. Your soup reminds me of Dad, one of his favorite meals was just macaroni and home canned tomatoes, heated and eaten like soup. Oddly enough, Elery says he ate the same thing when he was a child, just a soup made of home canned tomatoes and macaroni. Tonight we had hamburgers, one of the few things that both Elery and Mother will eat. 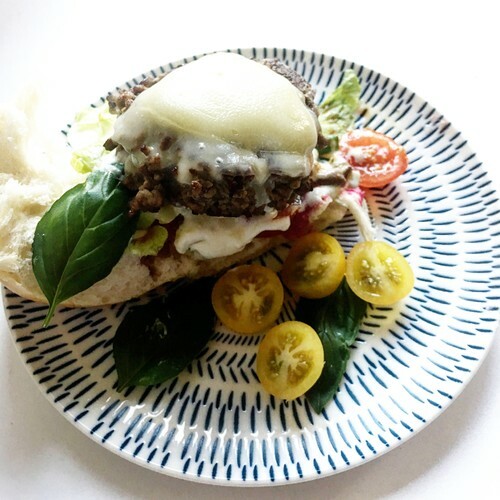 Low carb buns instead of homemade, but at least it was our own grassfed beef. Nothing with them, just the burgers, and no pictures. Hello dear friends! I’m so sorry it’s taken me this long to post – I’m done with chemo for now and feeling so much better – thank you so much for the kind words. DH and I had to crank things into high gear on our renovation so I’ve been busier then usual, thus no real time to post, though I’ve so wanted to! I tried to keep it simple and type just 1, then 2 meals of everyone’s that looked so good to me, but I couldn’t! Turned into a novel! This is one of the best WFD threads I’ve ever seen, with magazine-cover meals, comfort meals, healthy meals… you ALL make my mouth water! If I could I'd visit each of you and beg for all the meals on here! I continue to read and keep up, so I am here in spirit and heart. I will return when things slow a bit! 2many, I'm SO happy to see you back and hear that you are done with the chemo. I'm sending lots of prayers for a complete recovery and return to health for you, I've missed you. Ooh quiche sounds just what I’d fancy Annie, haven’t made one for ages. Hi 2many, so pleased to hear about your increasing good health. I’m sure I speak for all when I say ‘we’ are looking forward to seeing your meals when you are ready and able. Love all your meals AnnT especially the soup and toasted bread. We have rainbow trout in the rivers around us but haven’t had one for ages. Yours looks great Artemis ma as do the ribs and pickled tofu which I have never tried. 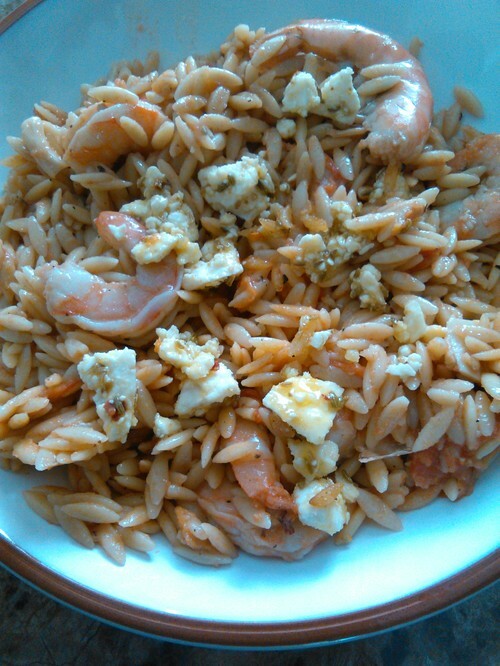 Jasdip, your shrimp, orzo, feta and tomato look tasty. It was you who first put me onto using orzo, which I now love. It has a good mouth feel to me. Cooking has been very haphazard around here what with the heat and being very busy. We’ve had take out a few times...that Malaysian Rendang curry is a favourite. Anyway, I made a tomatoless ratatouille with homegrown zucchini and baby eggplants, had it with a Italian sausage, was good. We DH and I, developed this truely fusion dish. Chicken was cooked Thai style with ginger, coconut milk, lime juice and chilli. The vegetables....I guess Chinese stir fry. But it was hubs idea to fry potato cubes and breadcrumbs (Panko) with a tiny dash of sesame oil in with the vegetable oil. It all sounds a bit weird but tasted good. nice to see you back 2MD !! All looks so good. Next time I see fresh clams.....!!! jan-feb is soups for us. Just like last year. And going through the packed freezer. Very 'fusion' here as well. Joined the RanchGordo bean club. Tried 3 to test...!/2 cup each of three would have been better than 3/4 cup but I'll make a leek top stock and freeze some 1/2 pints. perfect amount for soups and such. love that the little green flageolet keeps its shape firm but still a creamy interior. All out of homemade sausage so trialing a local butcher again...italian and lamb. it became very salty a few years ago but they seem to have corrected that thankfully. AND making both in the skinny casings spiraled which we love. Ann, it's impossible to adequately comment on your dishes. They're superb. Neely, I just read yesterday that you've had record-breaking temps this summer. AU is hot anyway, so I can't imagine being in the high 40C's. 2MD, I know you won't see this for a while, but I'm joining the others in being thrilled that you were able to pop in and comment. Hugs and healing thoughts continuously coming your way. 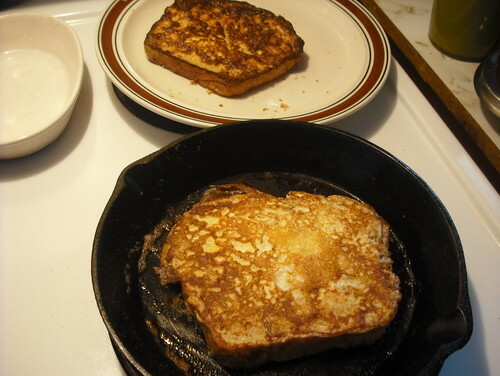 French Toast this morning. We've always liked it well done. Nothing would irritate hubby more than ordering french toast in a restaurant and it would come pale and mushy. Hahaha, a lazy, didn't know what to make, and just don't give a sh*t "meal". 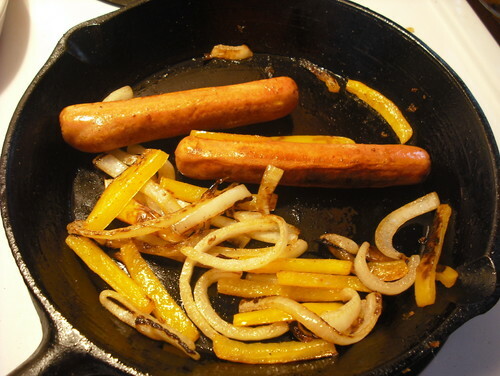 Sauteed onions and peppers to go over 2 hot dogs. 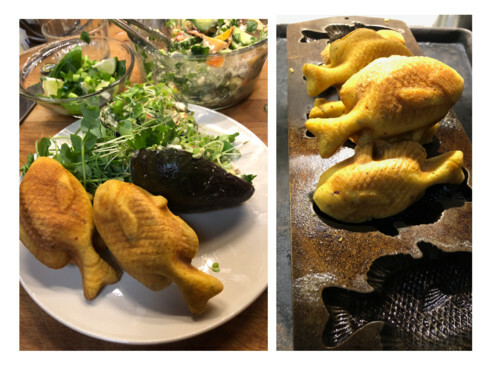 Yeah, but Jasdip, at least you gave enough of a sh*t to use your good cast iron and get some nice color on the peppers, LOL. I agree that I want nicely toasted french toast. I tend to like mine savory, with just butter and some freshly ground pepper. Once in a while I make it sweet, but not usually. sleevendog, the soup looks really good. 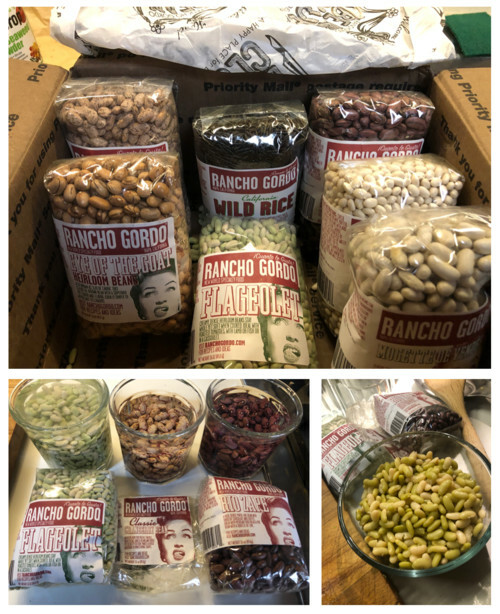 I've seen the Rancho Gordo beans, but haven't tried them. This year I did buy several new kinds to try, including something purple called Kebarika, bush Appaloosa, Nonna Agnes' blue (only 10 seeds, so I'll have to use them all for next year's seed), some crowder peas, Elery's beloved pink half runners, my old standard Italian Horticultural,and, of course, green beans. I've grown Mayacoba, Cherokee Trail of Tears, Greasy Half Short (which is my favorite, I think). It would probably be easier to just get them from Rancho Gordo, LOL. Neely, your ratatouille looks summery and good, especially as it's winter here. I could buy all those vegetables, probably, but they wouldn't taste the same out of season, probably. 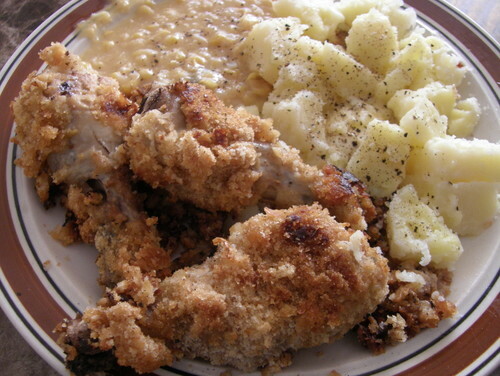 Here we had baked chicken, leftover rutabaga, some sauteed cabbage and corn from the freezer. Mother had a baked potato and said she was full, but is now having some dark chocolate and a glass of Merlot, so I guess she wasn't THAT full. (grin) The guys spent the weekend working on the bathroom remodel, so I made pancakes, eggs and bacon for breakfast and spaghetti and meatballs for supper, with cheese/garlic bread and green beans. Elery had his salad, of course. Well clearly I just can’t stay away! I’ll try to make this concise, but you all know me better than that! Jasdip, you said it better than I ever could have, Ann’s meals are beyond description. 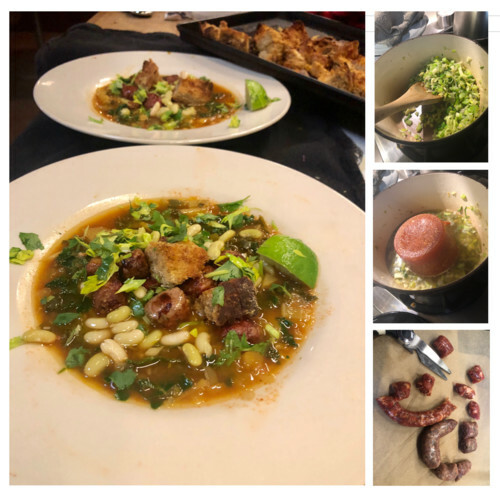 It’s extraordinary to me they all are cook-book photo quality and yet, no food ‘doctoring’ for the photos but rather meal-ready – I’d buy that cookbook in a heartbeat. Those clams just blow me away. Ann, you truly are a most remarkable cook. 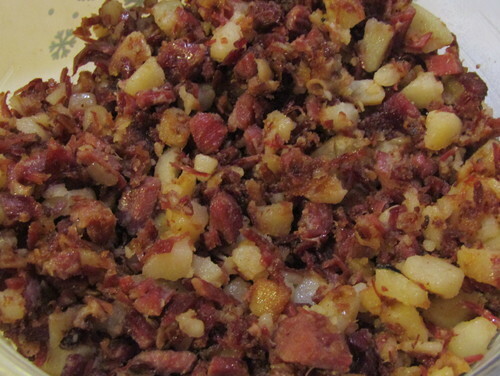 Neely, your corned beef looks so tender and I’m intrigued by your potato salad. 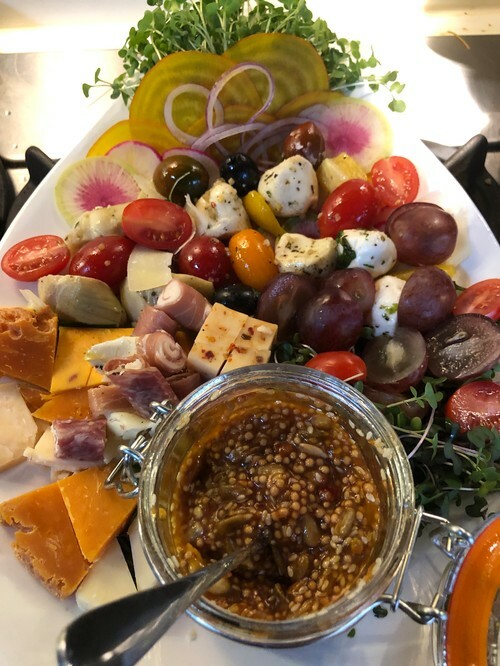 In late summer I tend to make chili and other winter-related foods in anticipation of cooler weather, and in winter I often find myself craving summer salads to remind me of warmer days! Annie, you continue to be wonder-woman, feeding so many, with so many preferences. 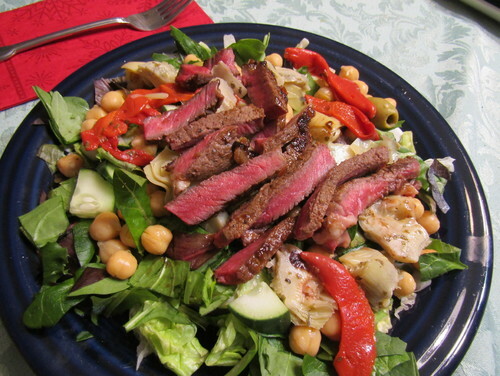 Elery’s steak salad with those peppers, artichokes, chick peas… Awwww… I’m drooling. The baked salmon and butternut squash meal sounds fantastic. Send me your remodel crew! They work 100 times faster then us! Enjoy that pretty new bathroom!!! 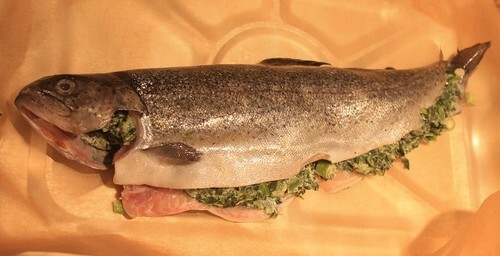 Artemas_ma… whole, stuffed, rainbow trout… good thing I was not present, that would have been barely enough for only me ; ) Last time I found good rainbow trout I made it almandine and wished I’d stuffed it instead. Talk about saliva-inducing! No complaining about fast food anymore. We did eat at a local steakhouse and had the loveliest meal, and it was relaxing, which I sorely needed! A couple days later we enjoyed DH’s favorite Mexican restaurant. Still eating lots of grocery store deli salads from their salad bar as well as Thai to make up for the ‘other stuff’. DH’s salads are always meat and cheese heavy so I try to pick them up instead. Every time we think we are zooming forward on the remodel something happens to slow progress. Still, I remain very excited! Ann, as Annie commented some time ago, you are right, I’m overdoing it, but I know no other speed than ‘fast’! I still relax in the evenings, no matter how cold (even 8 F), I sit on the back porch, cup of coffee in hand… daydreaming about – not the new kitchen, but meals I want to cook! LOL! AnnT... silly or not those toffee squares look delicious. Had to look up the word Casarecce pasta and saw that it was a pasta shape I particularly like. Looks yummy. Just saying Hi 2 many. Jasdip, I’m sure your hot dog meal was tasty. Sleevendog, I am constantly amazed and in awe of the variety of foods you use. The soup looks perfect. 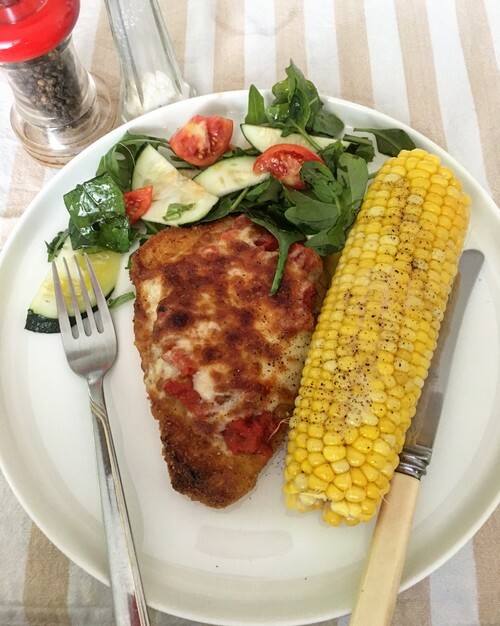 I was craving chicken Parma and as I had pizza sauce in the freezer and pizza cheese in the fridge, I made it. With salad and an enormous local grown corn. I made a dessert, first time for ages other than fruit salad. Eton mess... crushed up meringue with nectarines and raspberries and fresh whipped vanilla cream. 2Many, just saying hi, too, and how glad I am to see you back! And this guy sends regards to Snow Cat. He thinks she's cool. wintercat, now he's a cool looking dude! Gorgeous cat, beautiful setting. Clearly King of his domain : ) Snow Kitty sends regards back (yep, she actually was peering into the monitor - not sure she actually saw anything though!). She remains a comfort and a joy, acrobatic, amazing climber in the house (much to DH's horror but my delight), sweet and tender, and yet... I swear she gives me dirty looks when I tell her 'no'. LOL! We are now tearing out parts of walls we tore down, moved and put back in (after drywall and painting???!!!) as DH came up with a 'better plan'. I agreed, but gosh, are we ever going to be done? DH said maybe in another 2 months, then said, well, most likely not. I know not. Meanwhile I have all your lovely meals to sustain me.... visually. Just wish my monitor had 3D capabilities, or at least taste-o-vision! Last night was KFC chicken pot pie. Night before was Thai beef and garlic with fragrant rice and tons of fresh veg - love all the snow peas. The best looking pizza always. Maybe for breakfast tomorrow. Soups and soups here. Sundays we have a day off soup. 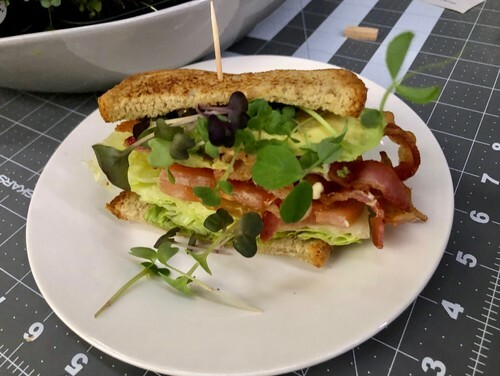 Smoked salmon Avocado BLT with extra B on levey's jewish Rye. Levey's makes the best grilled cheese with tomato soup. How much bite does the batch with red pepper flakes have? 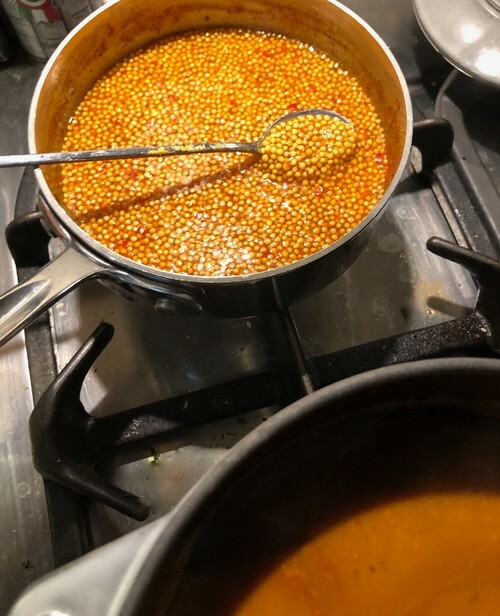 Pickled mustard seed is very mild to begin with so I tend to spice it up a bit. It was just a scant tsp. Same Chinese chili flake I use for chili oil. This seed was soaking for nearly 48 hours until I could get to it....the chili flake soaked along with. I'll probably need to salt and spice a bit more as I use it. I made another new recipe, one from ATK. 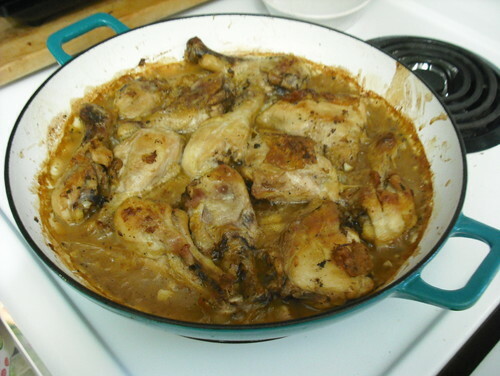 Chicken with a Lemon Sauce. I used my enamelled braiser because it's bigger than my 12" skillet but my chicken sticks every single time. I cleaned it up and it's now for sale. I'm sick of fighting with it. I roasted potatoes carrots and cauliflower as well. Darn! Sorry for the blurry pic, it makes my eyes hurt, so yours must as well. Looks good Jasdip. Sleevendog your BLT looks amazing. Love your pizzas AnnT, the base looks so good. Tend to stretch mine out too much to get space for lots of topping but they are usually a bit too thin. Made a burger without toasting the roll, added beetroot dip for yumminess. The beef patty kept sliding off before I could get a photo. Sleevendog… homemade tomato soup with salmon avocado BLT’s on rye? And your microgreens which I can’t wait to start someday… Comfort food that’s healthy too! Wish I could reach into my screen this afternoon. Great cold weather meal. Heck, it’d be great on a summer day too! Neely, your burger looks juicy and cheesy and all things good : ) When they slide off you know they’ve got just the right amount of extras! Another salad bar meal Friday (very satisfying), Saturday night was Cracker Barrel breakfast (influenced by Sleeve’s How do you like your eggs thread - and Annie, I did mix my eggs with the hash browns) – over easy eggs, gravy and biscuits, grits, hash browns, crisp bacon - nice after a day of work and errands. Sunday night I reheated bar-b-que sandwiches from the local grocery deli, added store bought coleslaw, some baked chips, pickles, and cheese slices (no veg in the fridge). Sounds awful, but we enjoyed it more so than forgettable fast food meals. Making progress with the remodel. Gave the cabinet maker my pound of flesh… ha! Honestly, we lucked out with such a great guy! We got our kitchen can lights in (no more changing batteries on the work light! ), more painting done. Snow Kitty climbed the attic ladder again.. took me 4 ladder trips and 3 hours to wrangle her! Then she walked on a freshly painted window ledge… The pup was better behaved for once! 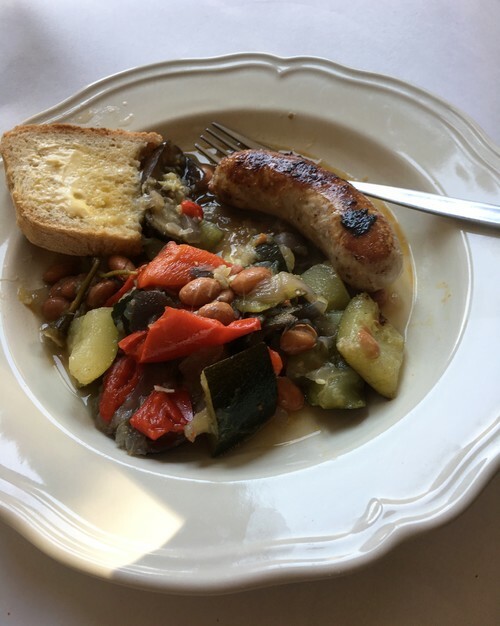 DH and I lamented over the homecooked meals we missed, listing which we missed most. That was such a bad idea! 2Many Snow Kitty is quite an adventurer!!!!! I'm so glad to hear your remodel is coming along nicely. Of course, ATK has blanked out their website but I found it at another blog. She used 2 breasts and the original recipe calls for 3 lbs of mixed chicken. Oh, that looks like a good recipe! 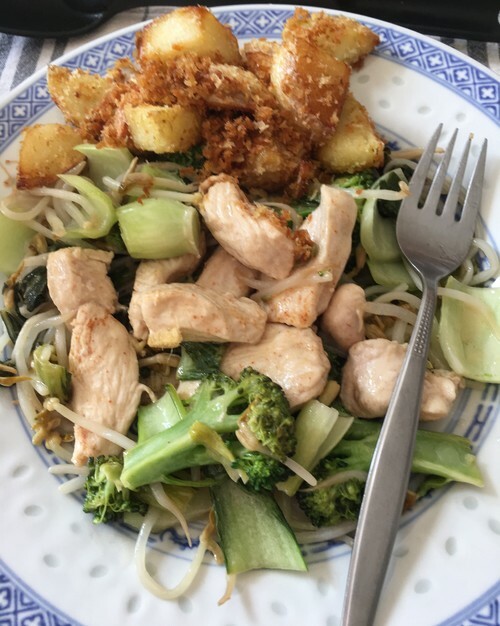 Thank you for sharing and finding the other for me, Jas : ) Though I can't cook now, I daydream about it constantly, and still collect new recipes. ETA: Snow climbs every ladder in the house, and currently we have 3 taller ones. Even when they are folded, she still climbs them! Of course, right now she's behaving beautifully, alseep on the window seat, head twisted upside down, one eye closed, the other open and watching me. She is very sweet and still treats our pup so gently. Sorry about that in the other thread, : ) We have enough links and cross listings among us. Last night DH asked if I was shopping for a new range hood, (!?!) haha, no, not at all but one glance at a model that I peeked came up all over his computer...oy. My sister who is without a computer or cell phone, (what? )...called for advice about some health tests she is going through soon...pre-research advice. Questions she should ask...I did some searching to help and now I'm dying based on my searches. I cannot be linked to any supplier as if I support them. I've had a fella in Latvia using my photos for years on his blog. Burgers tonight! Sweet potato fries! Speaking of climbing........when we first got Bud.....he was originally Mom's cat that we got from the Humane Society. He was forever climbing on things, top of the stereo cabinet etc. The final straw was when she was in the bedroom and felt like someone was looking at her. She looked around and Bud was on top of the door which was ajar. So we took him. When we brought him home, the first thing he did was jump on top of the frig and then down behind it. He was meowing because he couldn't get out, so we pulled out the frig and out he sauntered. Then I couldn't find him anywhere and I looked and looked. 2Many, I remain in complete awe of what you're accomplishing, even without everything else you're going through. Sleevendog, you might want to look into something like disconnect.me, if you're concerned about online privacy, although I don't think it can help much with what you actually post in a forum like this. Bud is gorgeous, Jasdip, but I'm glad none of our cats were ever big climbers. I haven't posted meals here recently. 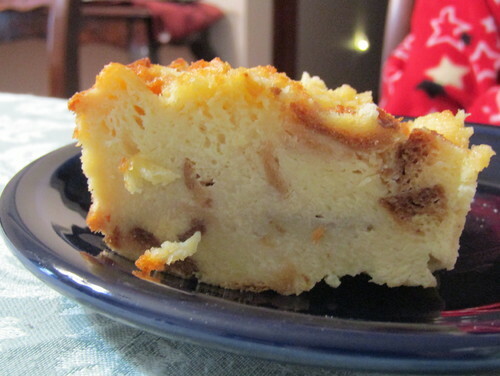 Okay... a pear upside down cake. I don't do desserts often, and I shared most of it with my local community center. I just simply wanted, for a vast change for me, to post something in the dessert family for Valentine's day on my blog. (Last year it was a shrimp salad where I shaped pairs of shrimp into hearts...) I do wish I'd been able to center that cake on the plate, but hey, at least it was all ON the plate! 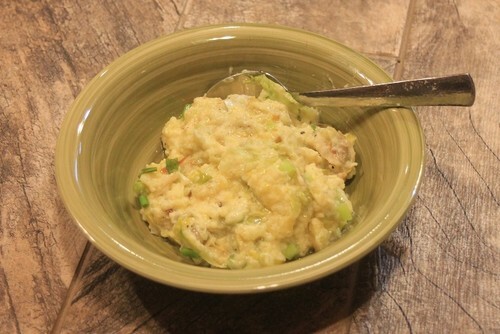 Colcannon: Cabbage, potato, buttermilk. 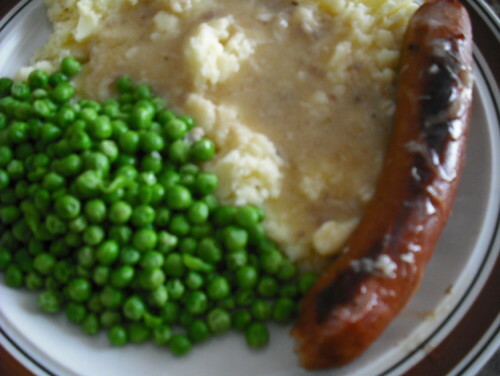 A preview of my St. Pat's post. 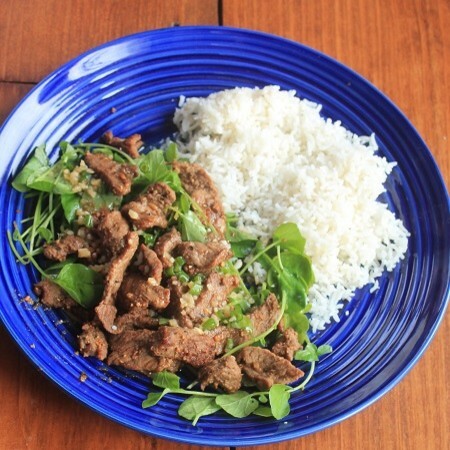 For the Asian New Year; Vietnamese beef and watercress, with rice. Love your cat Jasdip, that photo is so cute. So glad you’re ‘getting there’ 2 many. Well Artemis ma, what terrific looking meals All look so yummy. A quick pasta meal for us Orzo and prawns. You might be able to tell that the relentless heat has eased off in this part of the world a little, so I am able to cook again. I think it’s quite interesting how different countries’ speciality foods are quite similar. For example Paella and Jambalaya. 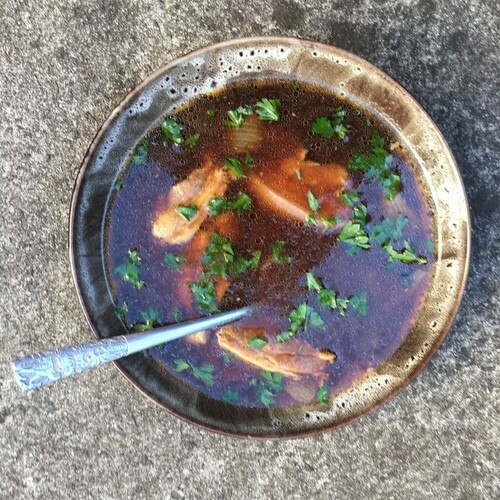 I have recently come to realise that one of my favourites Phillipines Pork Adobe, is very similar to the Malaysian Bak Kut Teh or Pork Rib Tea. 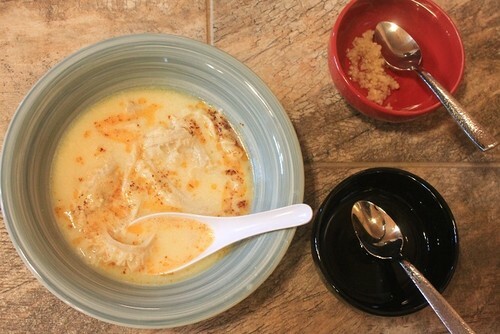 Although a few different spices are used in each, the tastes and over all presentation are very similar. I think I’ll just call it Pork in Spicey Asian Broth. OK, try #4. I'm not even going to try to post a picture because the last three tries the post just went away. Everything looks delicious, but I want that avocado BLT to go with my beef barley soup, then some colcannon just because and some lemon chicken, and, well, everything. 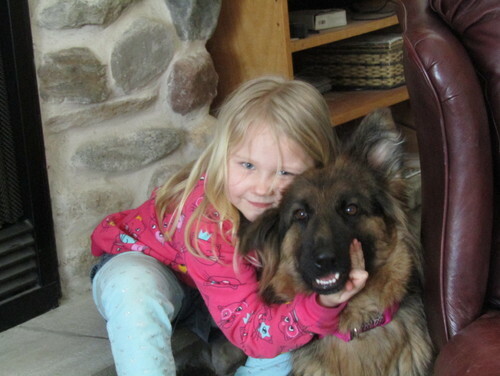 OK, I'll try this: While Madi helped make bread, Maci comforted their new shelter dog, Sage. My fat cat had the poor creature terrorized, chasing her from one end of the house to another. What a precious photo, Annie! Rooster legs with sage and wine sauce (and peppercorns). And, for those who don't mind a bit of an offal meal, a Turkish recipe for beef tripe (stomach lining) soup. It is served with minced garlic and with vinegar as condiments one adds at will. Yes, both of the above were very good! Now I know what Annie is talking about, having posts with pics not show up. Twice I tried to post on the WFD and it's not showing up. Be forewarned, if it shows up twice......it wasn't deliberate. Came here for food but leaving in love with a dog. Neely, I love your shrimp and orzo. Your Asian soup makes me want to dive right in, it's so appealing. Annie, WFD wouldn't be complete without your family stories. I love, love reading about your life. And Sage, welcome to the CF!! I'm such an animal lover and you're a sweetie. Today was a holiday for most of Canada, a provincial holiday. I celebrated my defrosting the chest freezer. That plus shoveling a girlfriend's driveway and my back is feeling it. 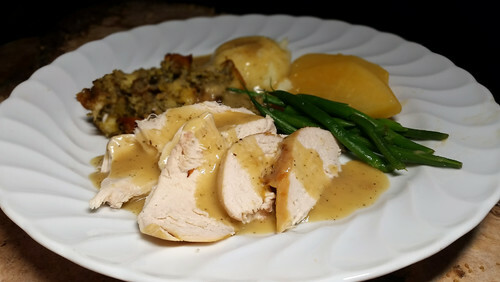 I roasted a chicken, the first in a long time, and it was delicious. I'm hoping that I keep enough leftovers for chicken noodle soup. Artemis, your Vietnamese Beef and watercress looks so delicious! I sure miss watercress. Used to grow wild here, easy to find, now no more. I hope to grow watercress microgreens (or minigreens, as Sleeven would say/do!). Why is it when one is trying to put a cake neatly centered on a platter it never happens, but when you don’t care so much, it’s always perfectly centered?! 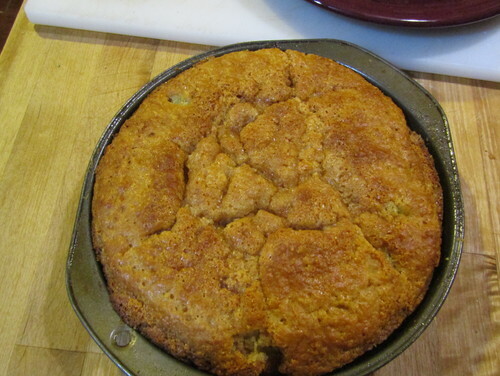 Your pear cake looks so moist and beautiful : ) And chicken so perfectly delectable when sage is used. I’m still re-visiting your stuffed trout… ! 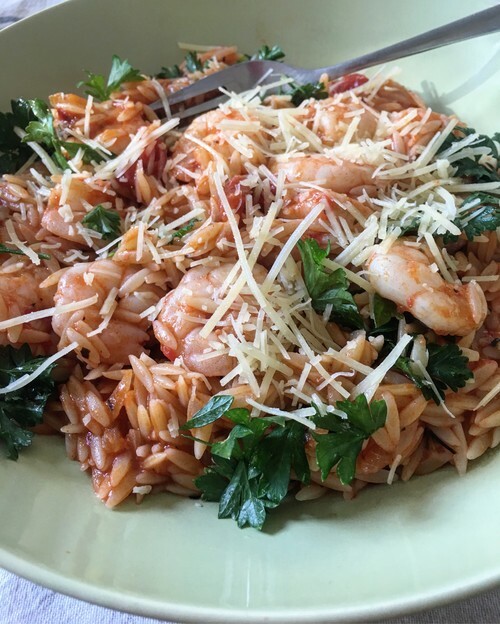 Neely, another home run with your shrimp and orzo dish – very pretty and you’ve got me hungry for a hearty shrimp meal. I don’t think I’ve ever seen a dish like your pork and Asian broth – sure looks rich and good! Annie, you’ve been doing a lot of cooking! 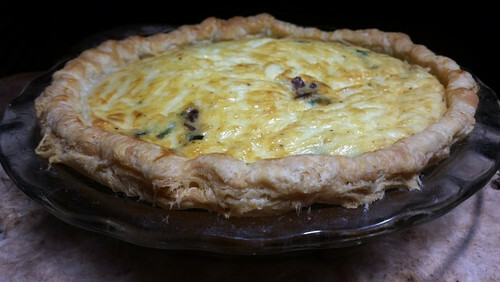 Between you and Ann I’m also ‘hankering’ quiche : ) Used to make it quite often, but haven’t in some time. Need to correct that! 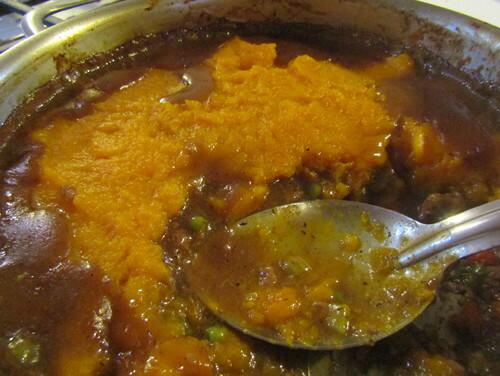 Love that you used butternut squash in a shepherd’s pie. 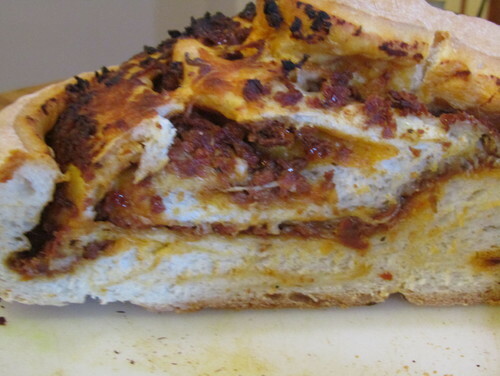 The closeup of your pane bianco makes my stomach grumble… if I remember correctly, that’s the bread that should have taken first prize, right? I shoulda been the judge! 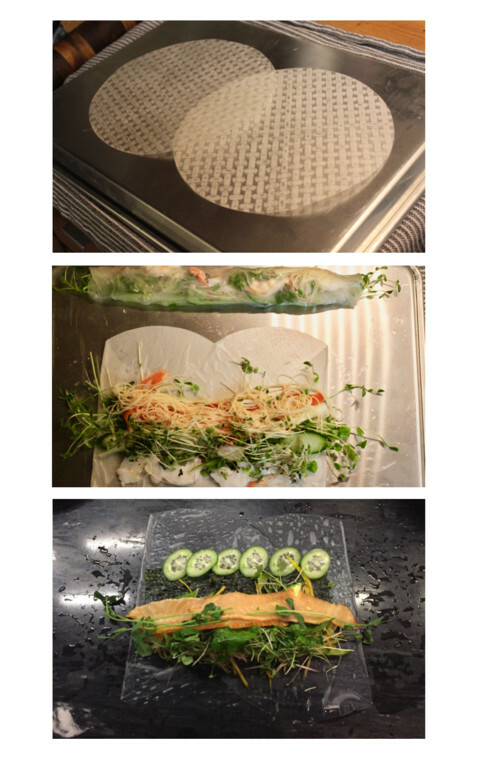 Sleevendog, I just realized you’d mentioned (above) how you kept spring rolls fresh for a few hours – thank you for the tip! 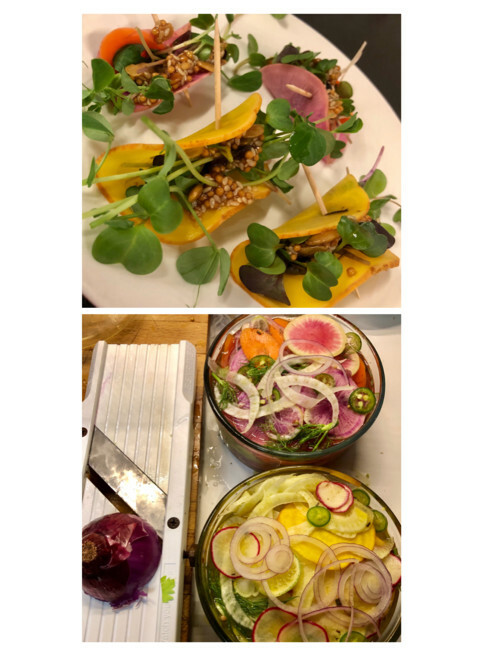 The photo of yours with your mustard (on the Valentine’s thread) had me swooning… that lovely pop-in-your mouth mustard on spring rolls – genius flavors! Here… lotsa salad bar salads (not what we’re wanting in cold weather, but better than fast food to our stomachs and bodies); a Pizza Hut pizza, soggy crust and all; and a chicken dinner from KFC. We’re at the 10-month mark now, living without a kitchen, bare plywood floors, and a couple plastic chairs. The wood for our floors was delivered last night – yay! They said won’t be installed for another 3 weeks. The finishing process takes 5-7 days, and another 7 days we can’t walk on it. That means DH, myself, and the ‘kids’ will be relegated to the front foyer and bedroom for 2 weeks. I hope we survive! LOL! Meanwhile Snow Kitty now sports nail caps (black, against her white fur makes quite the fashion statement) – she doesn’t scratch or bite, ever, but loves to sharpen her nails on everything. She tolerates the nail caps incredibly well… ‘soft clawing’ everything in sight! Our small dog is in diapers… her age has caught up with her. She’s been a sport about it. I have dreams about loading dishwashers, missing a real sink I suppose. You’d think I’d dream about cooking, but clearly seeing these wonderful meals all the time keeps my subconscious from torturing me! Just peeking in and loving the food pictures, recipes and friendly chatter. Annie: I love those pictures of Madi and Maci and that beautiful dog. 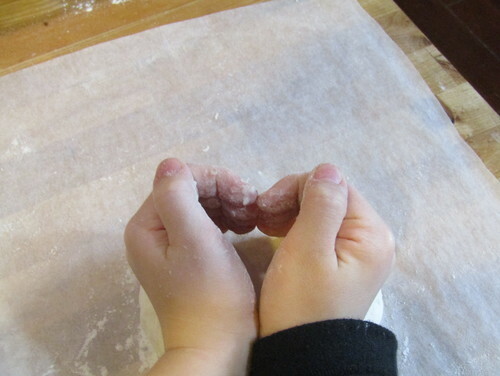 Madi expressing how she feels about baking bread with you is a picture to cherish! Tonite was a sausage with leftover whipped potatoes and yes chicken gravy. I have no idea why the pic is so close, I wasn't laying on the table! Jasdip, mine went away again and I just typed a long reply. 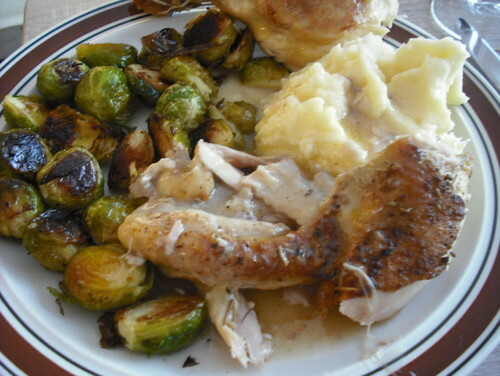 (sigh) Your chicken looks delicious but those mashed potatoes, that's what I'd go right for. FOAS, that poor dog is just a sweetheart. She was a rescue from a puppy mill, used as breeding stock. She's less than 2 years old and has already has puppies. 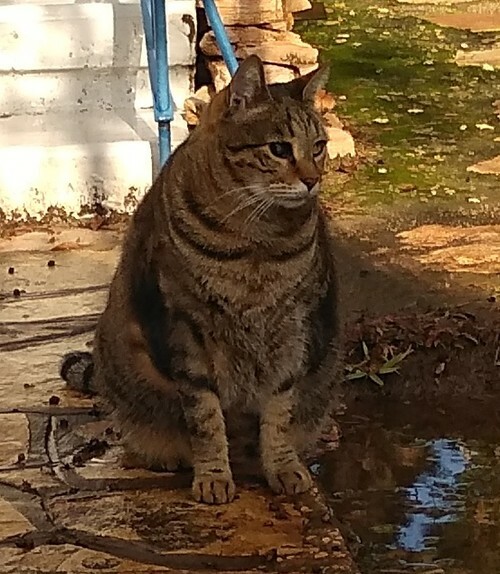 She's also about 15 pounds underweight, she only weighs 20 pounds and that's now that Ashley has put a couple of pounds on her. She isn't completely housebroken and has spent her entire life in a cage, so when the girls went to visit everyone was apprehensive. Except Sage, who came bouncing out with a happy tail, licking the girls and playing with the toys they brought her. Just like that, Ashley had a new dog. She won't be the size of Rex, their prior German Shepherd, who tipped the scale at over 100 pounds. She's already figured out where the food is in my house, though, and will sit at the refrigerator and wait for me to give her bites of beef, LOL. Neely, I'm glad your heat moderated. Even with air conditioning it's not much fun to cook when it's so hot. Artemis, I agree with 2many, that cake doesn't need to be centered on the plate, it looks perfect the way it is. It wouldn't last long here anyway, not long enough for anyone to notice! Lizbeth, I agree, I think that picture needs to find a place in my kitchen, quick, before she gets bigger and things like dances distract her from my kitchen! I stopped at a little "farmer's market" on the way home from Grand Rapids yesterday and they had cooked crawfish for $4.99 a pound. I bought a pound, brought them home and cleaned them and today we had etouffee. In spite of the dreaded cauliflower rice, it was pretty good. Mother wouldn't touch it, she ate leftover baked chicken. And Houzz won't let me post a picture, so you'll have to trust me. 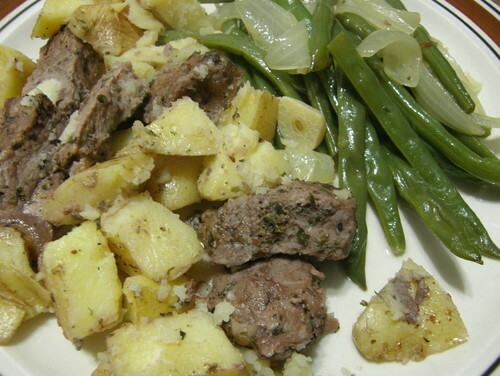 Home canned green beans as a side. Heartbreaking how some animals are treated… the crazy thing is, when you ‘rescue’ a pet they enrich your lives far more than you improve theirs : ) Sage is in loving care now, and it appears she has a co-conspirator in Maci – don’t they both look like they’ve got an amusing secret?! The Soft Claw caps are easy to apply, but you need to be able to hold the paw(s) gently, press to extend each claw. They do recommend clipping the tip off the nails first, and I do with Snow. Cats also shed the sheaths (outer claw layer) around every 3 months, so the Soft Claws will come off at that time. Snow has had hers on for 2+ weeks now. She did pull 2 off with her mouth after a couple days of working on them (glue dried too much before I got those on), but I just popped more back on and she gave up bothering with them. I’ve read they typically last around 2 weeks, but everyone’s mileage varies. They come in colors which helps when one falls off. I clip her claw tips off… then we sit in the bathroom (small room so I can get her back if she jumps off my lap). I don’t use the little applicator tip for the glue (it just dries and clogs for the next use), but stuff the tip of the glue bottle into the caps one at a time, give a good squeeze. Lay them on a paper plate. Put Snow in my lap, hold a paw, and one at a time extend her claws and put the caps on, pressing a little. I let her take a break between paws as I ready the next set. She wears the mediums and is 8+ lbs. You can have a vet put them on if you wish. Snow can extend her claws just fine, they don’t touch her skin, she climbs every bit as easily (rubber gives grip). Goes without saying but... I wouldn’t let any cat outside with these as they could not defend themselves. I've been MIA this year after a super busy January and February but I can't post any pictures. Hello to everyone! Hopefully this one will work! Argh! I do see your post cookebook - glad to see you again! My post re: cat soft claws for Annie shows up on the pc, not on the cellphone. 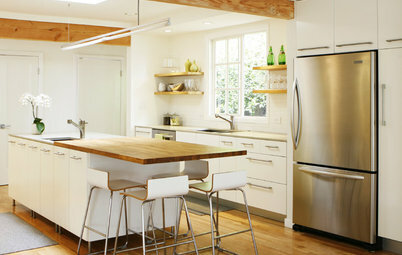 %#%$# Houzz! I posted one yesterday with lots of pictures but it never showed up! Glad you are done with your chemo and the remodeling is going full blast! Thank you cookebook : ) You might try again... sometimes it takes a second (or third) try. 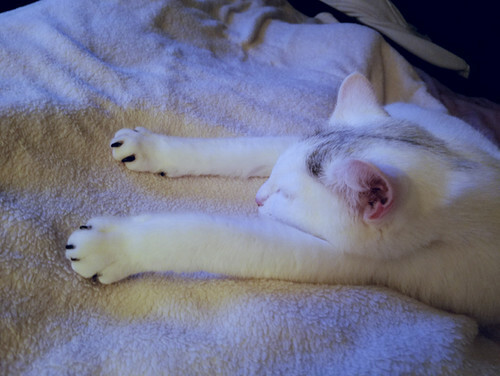 My post re: cat soft claws for Annie shows up on the pc, not on the cellphone. %#%$# Houzz! I don't see it on my desktop computer, either. This place is a wreck these days. Sad day for the WFD postings. It seems Ann_t has been evicted. I don't visit hot topics or any other categories much. But some 'heavy hand' made a choice to cancel her. Things do change as houzz advances in their interests. Obviously they kept all her photos and content as powers do. Also why I deleted some of my content that they may have wanted to 'own'. If all this continues, ann_t is on egullet. A nice friendly exchange with all things food but not stuffy. 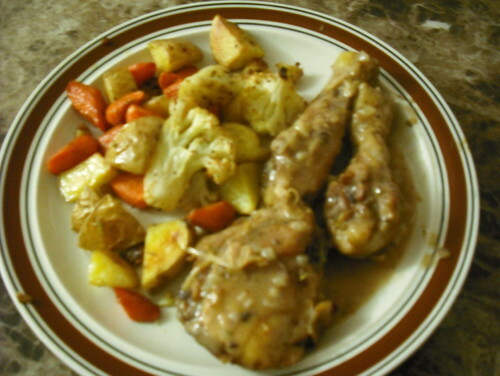 (some of the 'whats for dinner' pics are as sloppy as some of mine) haha. Possibly they might welcome a 'What's for Dinner' GardenWeb OldTimers thread to get acquainted. Or just visit and lurk. Thankfully she has a blog she keeps up with that I have saved on my desktop favorites. I've been leaning more and more to private forums without pocketbook interests. I get it as money is the goal for most. But a pleasure when some just want to support content and community. If this is true, I'm pissed. Who would not see her contribution over the years sharing her recipes and methods !!! NOoooo! I've never visited hot topics (I don't think I have, anyway) but I don't care. Second person I am aware of who's been kicked off. I can't believe this. Thank you for the heads up Sleeve. Ann, if you're reading this, when things slow down (remodel has kicked into high gear now) I will join egullet if only to read your posts (I feel I might be a bit intimidated to post there), but in addition, I have an old email which takes me to your blog easily (and I visit often to look for recipes of yours) so I'll enjoy seeing you there. I hate this, for you, for me, for everyone who absolutely will miss you. I'm shocked. Uh, is there anything I or anyone could do about this? Do you think Ann would come back if there were? There are some extremely petty people on HT. Don't understand why H---- allows them to get away with some of the things they do. 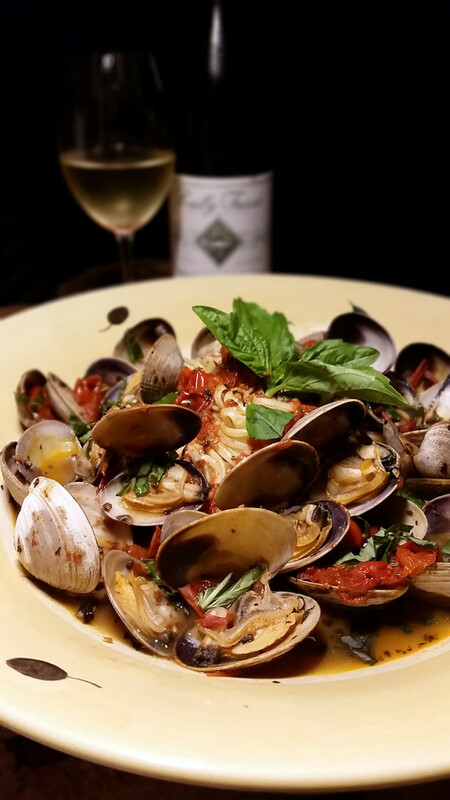 AnnT has been a cooking and photography inspiration for nearly 20 years. Even if she is excluded from Hot Topics why this Forum as well.? I’m quite shocked about this and don’t know how to proceed. I was banned from GW a couple of times, they thought some of my daily threads over on the Kitchen Table were Spam. I was able to read, but not post. I hope Ann can write to Tamara, if she's still part of Houzz and ask to be re-instated. Hot Topics scare the bejeebers outta me! As well, here's an article about Houzz laying off a bunch of staff in the UK where it originates and in the U.S. It might be just the beginning and be bad news for GW all around. Tamara has been gone a long time now. There is a great deal of, uh, enforced exiting of people who post in HT, without any warning. If you read there much, it quickly becomes clear whom they target. ETA Be aware that use of the ‘b’ word tends to get threads disappeared these days. A lot of people on HT have been getting tossed lately. Many come back with a new account, as hopefully will she. Well, one more reason why I stay away from other forums. I found the Tomato forum extremely unfriendly and I did check out Hot Topics. Once. I very quickly decided that it was certainly not for me. But AnnT? Really? Of all the stupid things Houzz has done to alienate users, that one tops it for me. What's for Dinner? I made venison burritos. 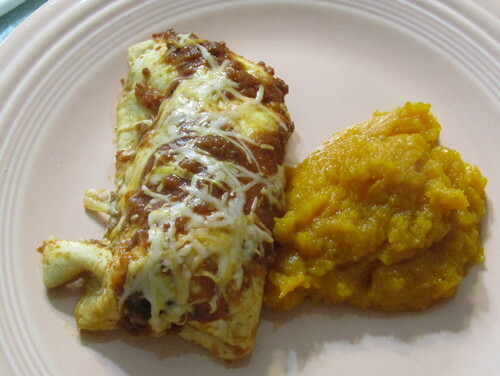 Low carb tortillas, low fat cheese. They sucked and I have heartburn, plus now I'm just generally ticked off. No pictures. Lots of good eating happening here. Jasdip, love that picture of "Bud". 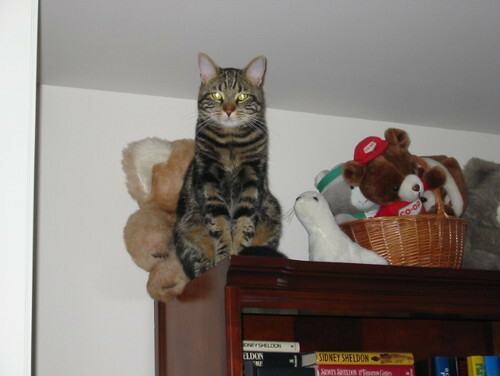 We also have a tabby, Molly, who loves to get up high. Annie, I think I'm in love with a dog too. Sage is beautiful. What a lucky girl to find her way to your family. Sourdough Rye. No commercial yeast. Really happy with the flavour of this rye bread. Well, those are familiar pictures, and the bread looks delicious. I think rye bread is my all time favorite. Annie, I’m sorry you didn’t enjoy your venison burritos. Restricted diets can be so hard. DH has been told by his doc he needs to lay off carbs and cut his quantities back (hard for him to do with fast/takeout food). He’s been doing modestly well since but is always hungry now. A minimum of 2+ months to go before I can get him back on track with healthier home cooking. Going to embarrass myself… I realize I’m tired, my brain is overwhelmed right now with other things… I literally cried with happiness! Yes, I’m a happy-crier : ) Ok, no more blubbering… Monty_Abby… welcome : ) : ) : ) Ah!!! Sourdough rye??!! Some people can do it all! I made rye a few times and called it quits (brick dense, hard, taste was off). Yours is perfection. And it’s sourdough. Heavens. 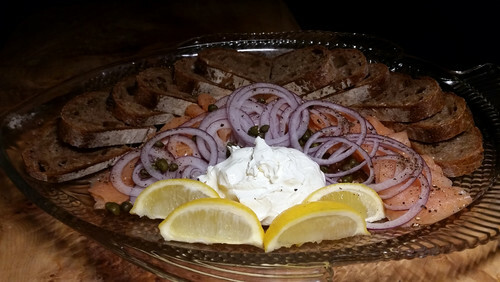 While the platter looks wonderful (capers, fresh cracked pepper, salmon… oh my), I’m fixated on the bread. 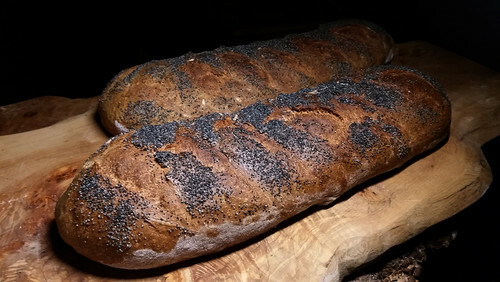 Hopefully, someday, I can tackle sourdough… and I’d love to try sourdough rye! I’m hoping you’ll guide me as I flounder! 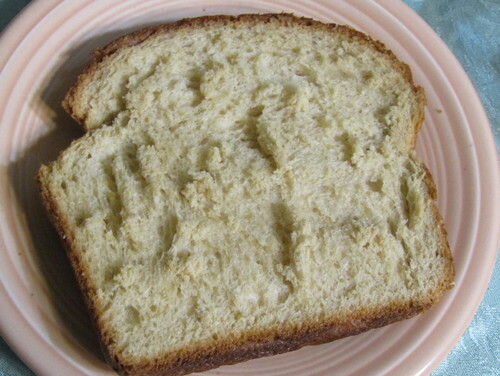 Uhm… I found a recipe on a blog I love, but the sourdough uses spring water. May filtered water be used instead? If not, is the spring water bottled? (Making notes for not too distant future baking). Here? We ‘enjoyed’ tv dinners. Night before was Taco Bell. Enough said. Hoo Rah Monty_Abby............this forum MUST survive one way or another. 2ManyDiversions, :). 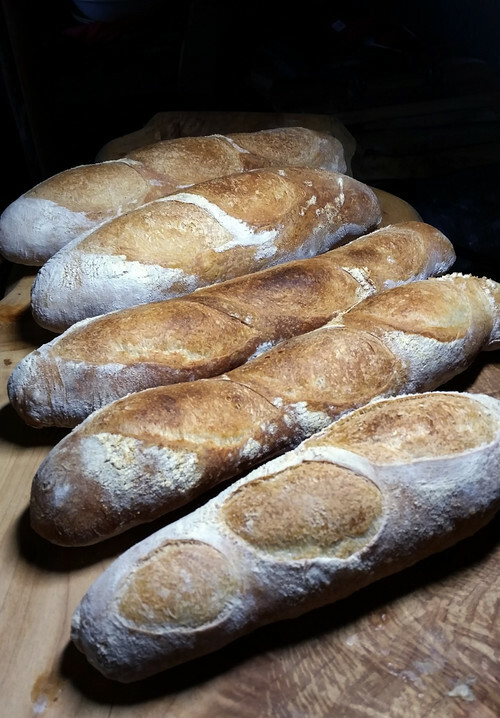 Let me know when you are ready and I'll be happy to help you get started with Sourdough baking. By filtered to you mean something like Britta? I don't use filter water, because Amy's Bread (NY Bakery) recommends bottled spring water and that is what I have always used to get a starter "started" and every time I feed the starter. I use our regular tap (well) water for the breads though. And yesterday morning for DH only I made Eggs Benedict with the remaining smoked salmon, served on rye toast and topped with Hollandaise. I think I planted enough squash, LOL. But have you made pumpkin scones? One of the few ways DH will eat pumpkin/squash. Thank you, Monty : ) That’s very generous of you. Yes, by filtered I meant similar to Brita, not Reverse Osmosis though. When I read ‘spring water’ my mind went to collecting the water trickling from natural springs in Colorado and New Mexico, eons ago. I thought to myself I’d probably get lost traipsing around the Smoky Mtns here trying to find a natural spring! LOL! 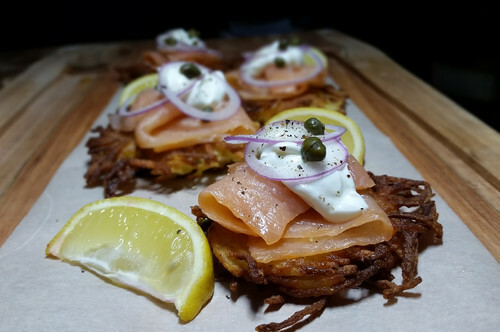 I’m very sure I can find bottled spring water at the grocery : ) Aaah, more sour cream (or crème fraiche), capers, salmon, and cracked peppers… my latkes never look that good – I tend to squash them too much. And not enough crisp. 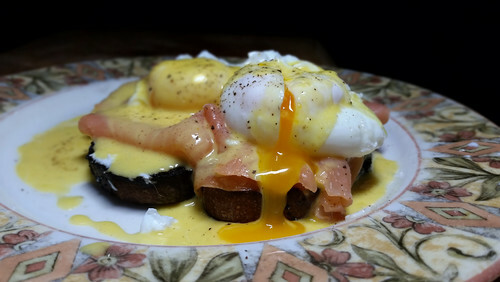 That is the most perfect photo of eggs benedict I’ve ever seen. I’ve got to stop staring at it… I’m salivating. Annie, really? That burrito looks fantastic! I find it impossible to believe it ‘sucked’ in any way! Your mashed squash is so vibrant and pretty : ) And I adore squash soup. 2,many, the problem with the burritos was in the wrapper. Those low carb atrocities are STRETCHY, and I have a big problem with the odd texture. So the taste was OK, but the texture was awful. Add some sauce and you get stretchy mushy ickiness. Ugh. Plus heartburn, LOL. Annie, I know just what you mean. I was on a very low-carb diet for a while and it was better just to skip wrappers and taco shells and such. Ick. 2Many, today I can see your soft claw post. Go figure. Monty, nice to see you here. I don't care for most sourdough, but I bet that rye is divine. 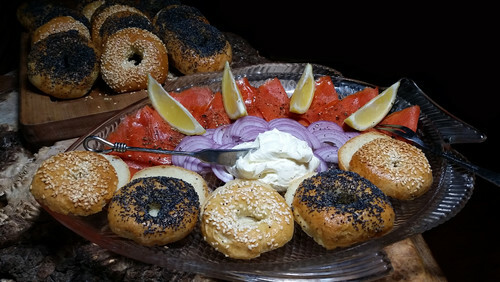 I'm salivating over that smoked salmon platter--heavenly! What is 'beef base' ??? ?